Note: If you happen to be a master cabinet-maker who repairs Chippendale furniture for fun, this project will be pretty straightforward. For the rest of us, it is a supreme challenge. 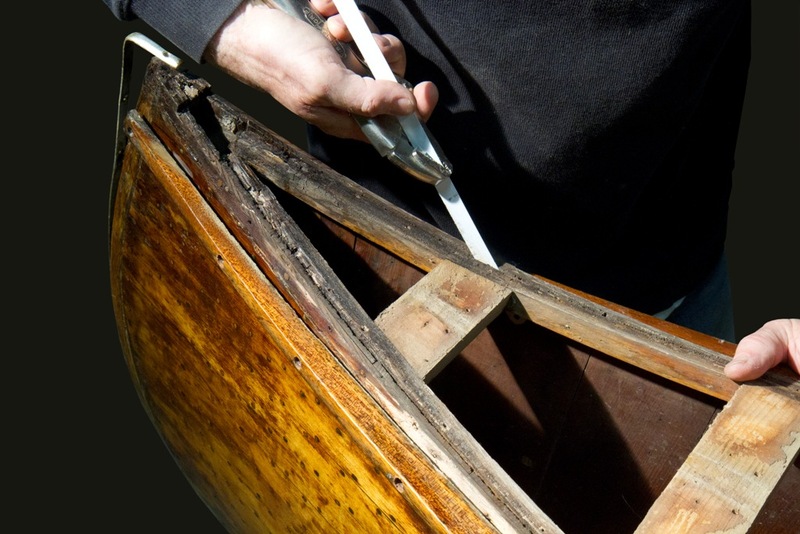 Many of my adventures in repairing fancy canoes employ a trial-and error methodology. In this project, I used the error-and-error method. As I take you through the process, I describe some of the pitfalls I encountered. I hope this helps you avoid some of them. 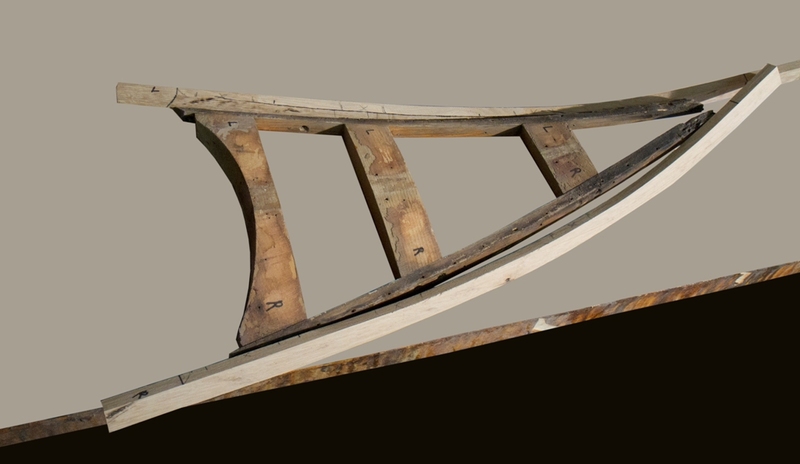 Long decks are found in both wood-canvas canoes and all-wood canoes. They are comprised of a number of components. 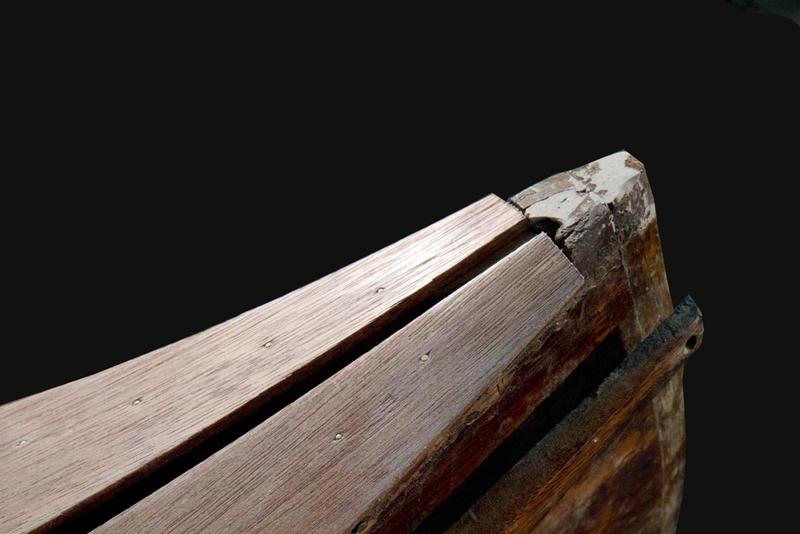 Most often, the deck itself is two pieces butted together down the centre-line. The king plank covers this joint while the coaming covers the end grain of the deck and king plank. These decks were made in one of two ways. 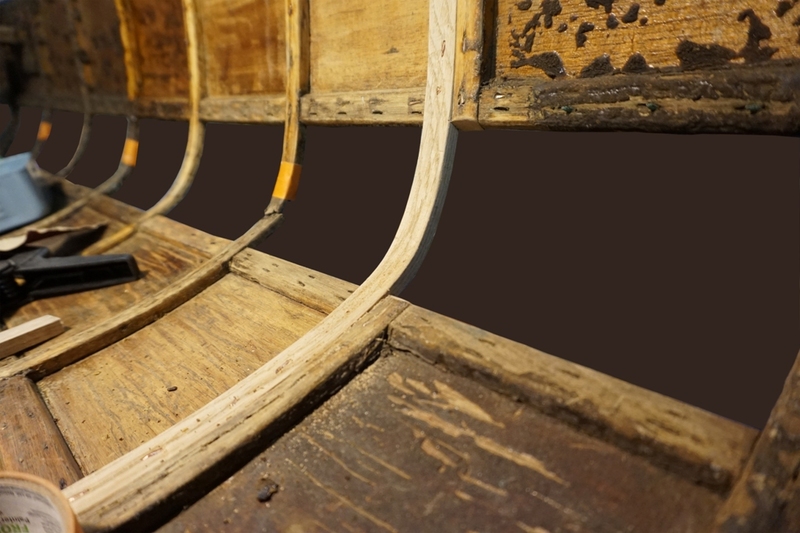 The first method, already described in a previous blog article, is to pre-bend solid wood for the deck to fit the graceful curves in the ends of the canoe. 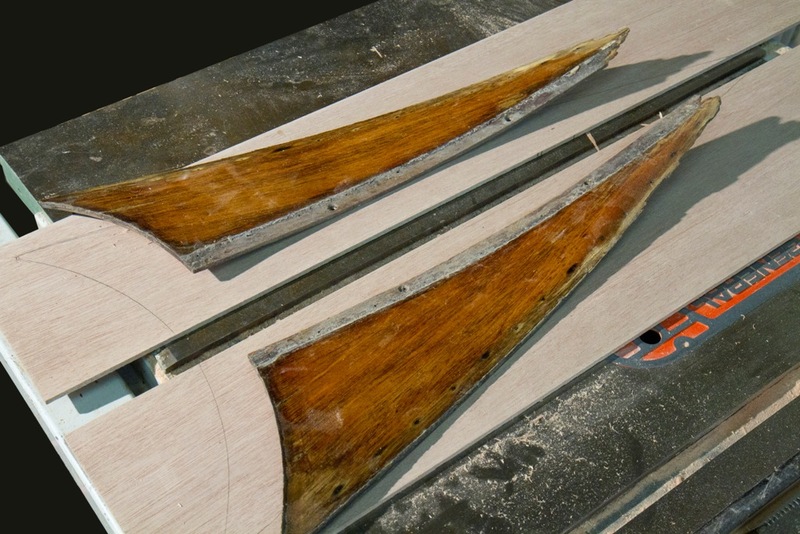 The second method is to build a frame at each end and cover it with thin veneers (usually two pieces of mahogany). 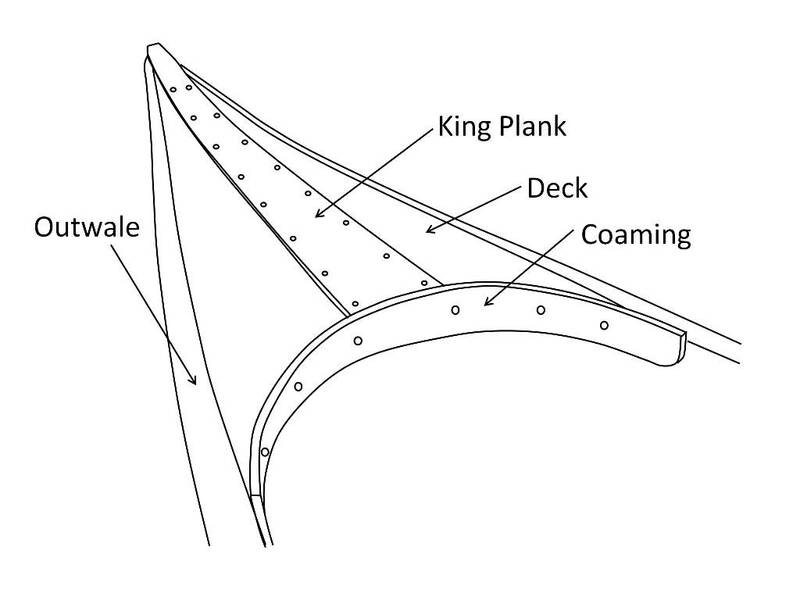 The king plank covers the joint between the deck veneers while the coaming covers the frame as well as the end-grain of the deck veneers and king plank. 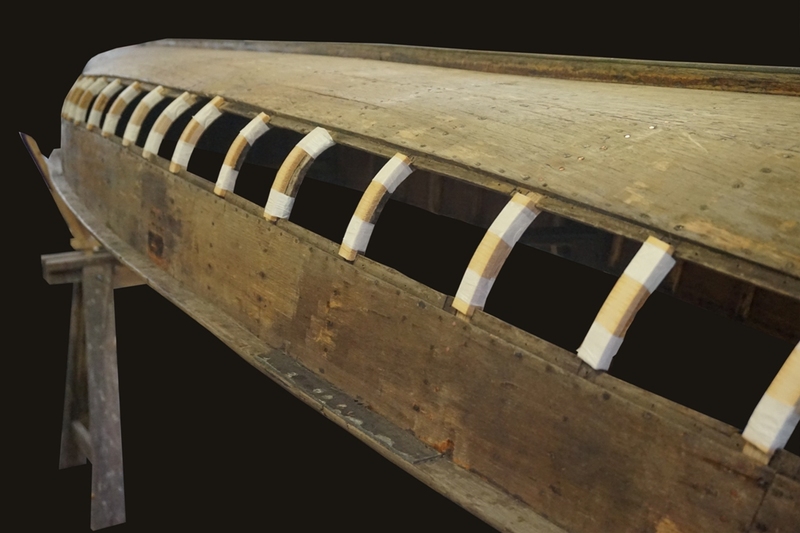 Some companies built the frame directly into the structure of the canoe and installed the veneers afterwards. 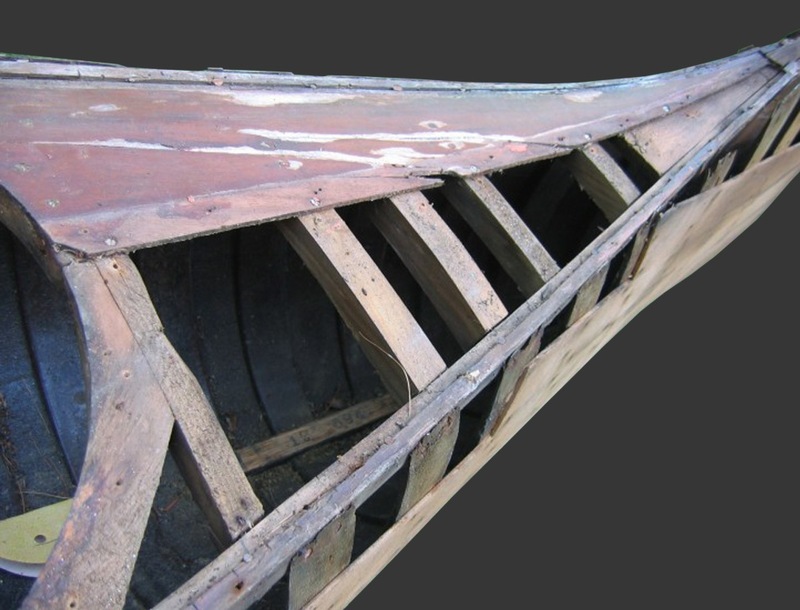 I repaired the stern deck in a 1948 Willits Brothers canoe. In their shop, they installed the framed deck after it was fully assembled. The first step is to remove the deck from the canoe. 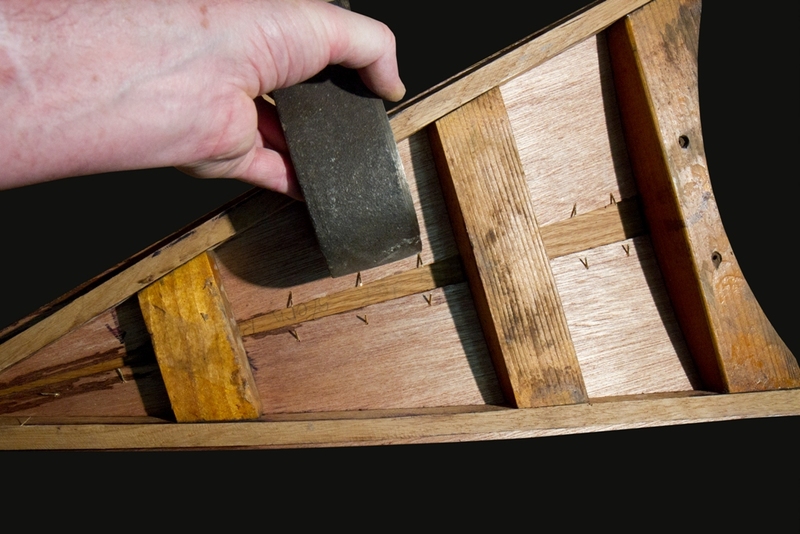 Start by removing the coaming. It is held in place with six #8 brass flat-head wood screws. Set it aside to be re-installed near the end of the repair process. The king plank is attached with ¾” (19 mm) 18-gauge brass escutcheon pins. 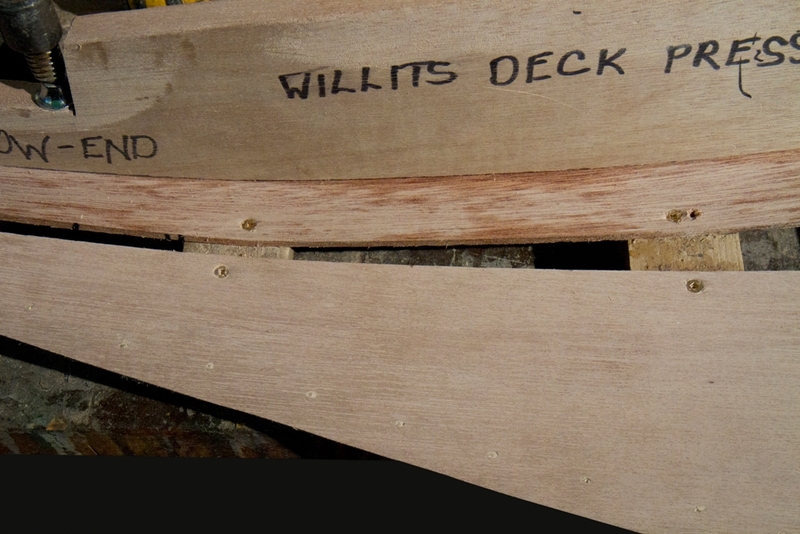 They are dubbed (bent over) at the back of the deck. Ease them out by working a putty knife between the king plank and the deck. Then, wedge a small pry bar between the putty knife and the deck. Working gently along the length of the king plank, gradually work it free from the deck as the brass pins straighten. 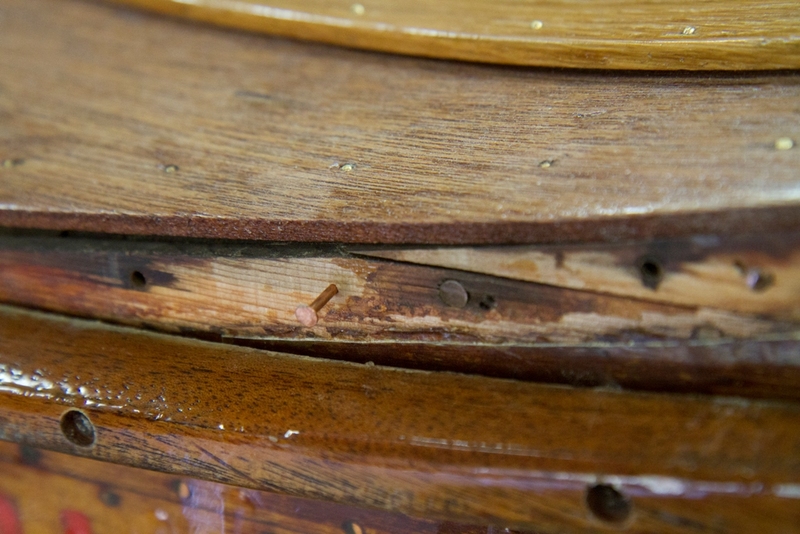 The deck veneers are attached with ¾” (19 mm) #6 brass flat-head wood screws (under the king plank) and ¾” (19 mm) 18-gauge brass escutcheon pins driven into the white oak deck frame along the outer edge. 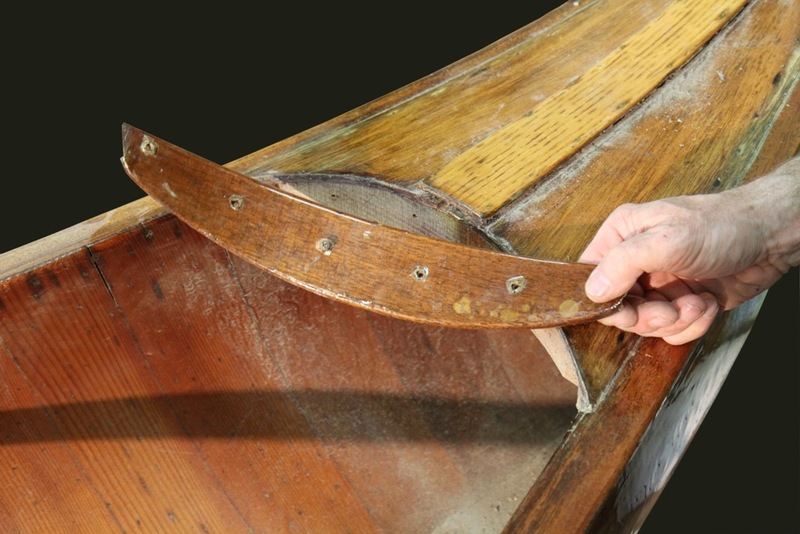 Use the same method to lift the veneers off the frame. 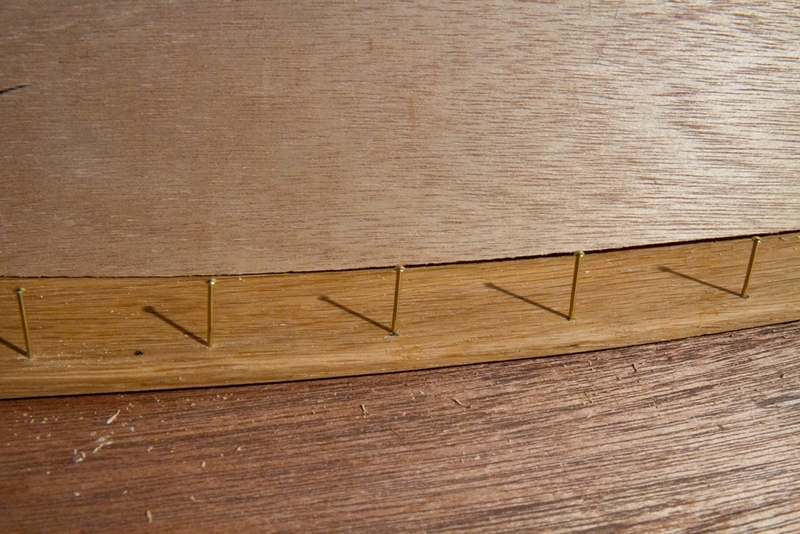 Some of the brass pins will probably pull through the veneer and remain in the oak frame. Remove them with a pair of bonsai concave cutters. 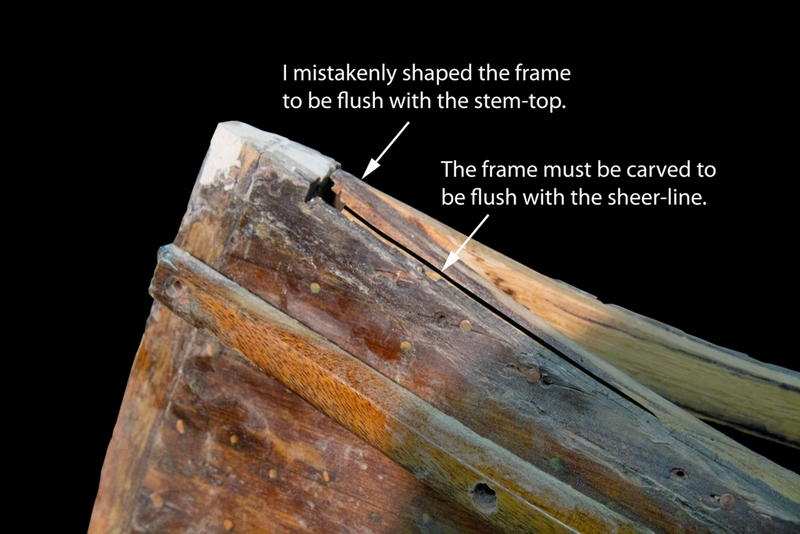 With the frame exposed, it is clear that the white oak side rails in this frame are rotted at the ends. 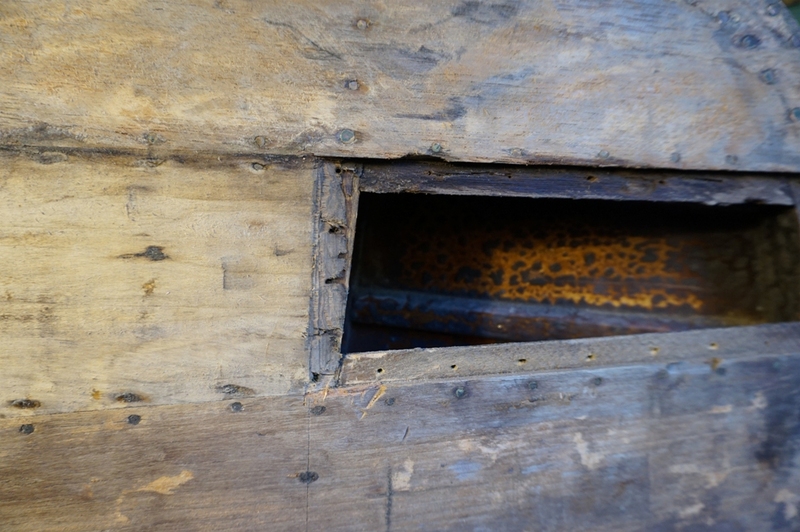 The outwales are attached to the deck by means of several #8 brass flat-head wood screws. Remove them to expose the hull. 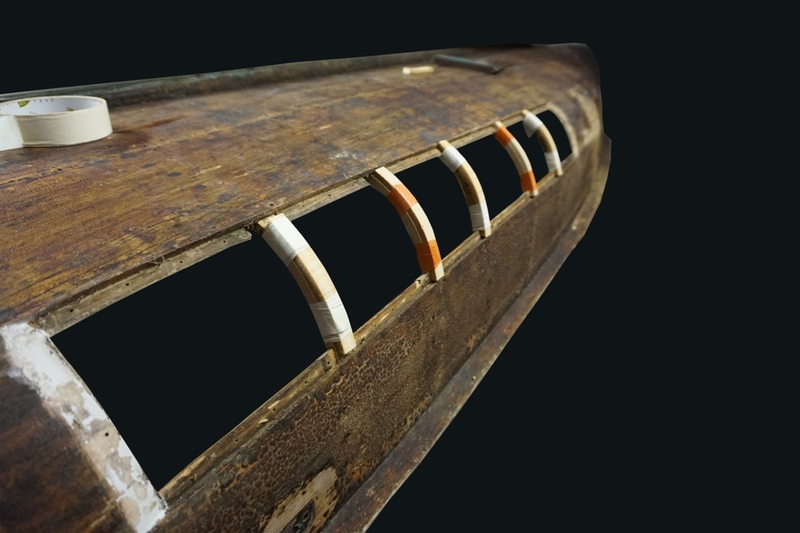 The main body of the outwales are attached to the hull from the inside with ¾” (19 mm) 16-gauge copper canoe nails. 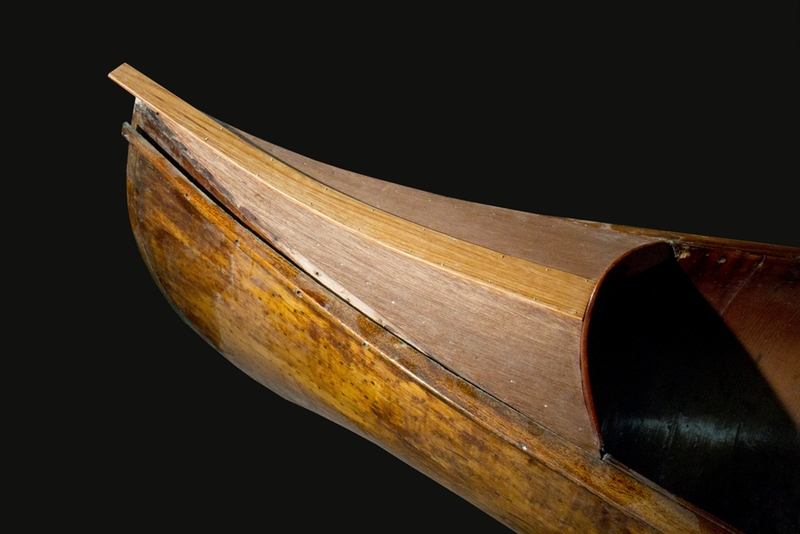 Remove a few of these with a pair of bonsai concave cutters to provide full access to the canoe hull in the region where the frame is attached to the hull. 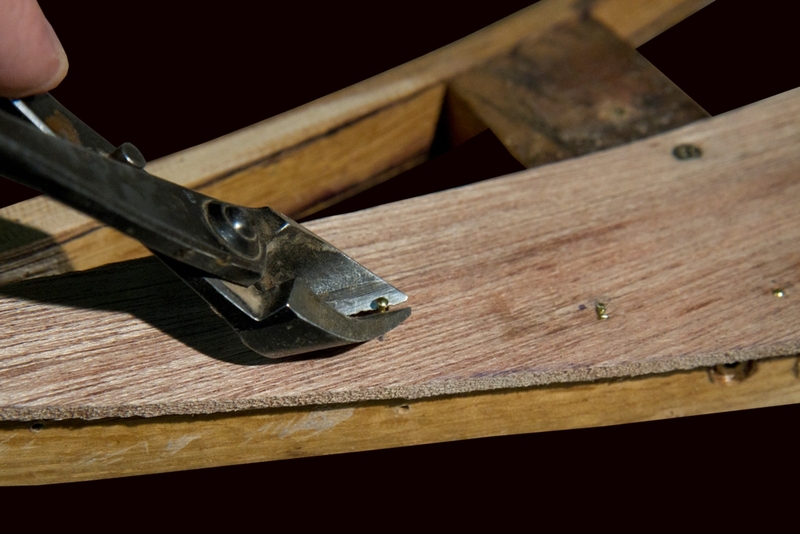 Clamp a pair of vice grips to a hack saw blade to create a strong handle. 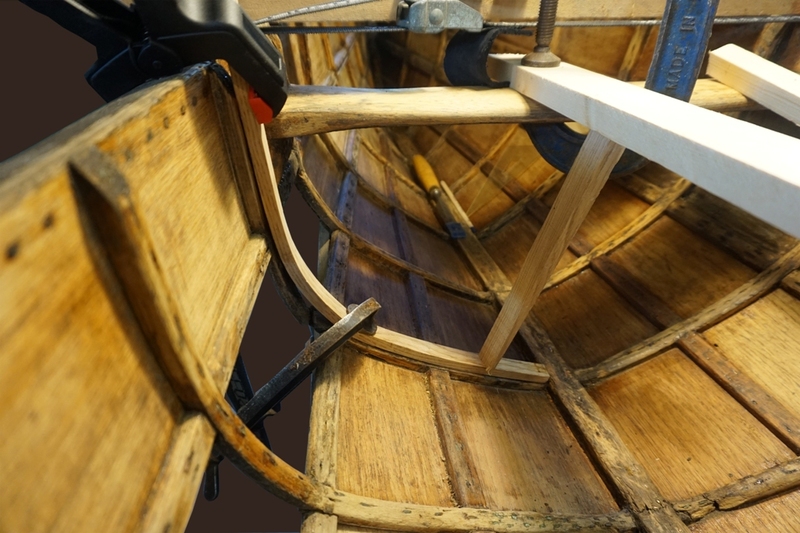 Work the blade between the deck frame and the hull of the canoe to cut through a number of ¾” (19 mm) 16-gauge copper canoe nails used to attach the frame to the canoe. Remove the frame from the canoe. 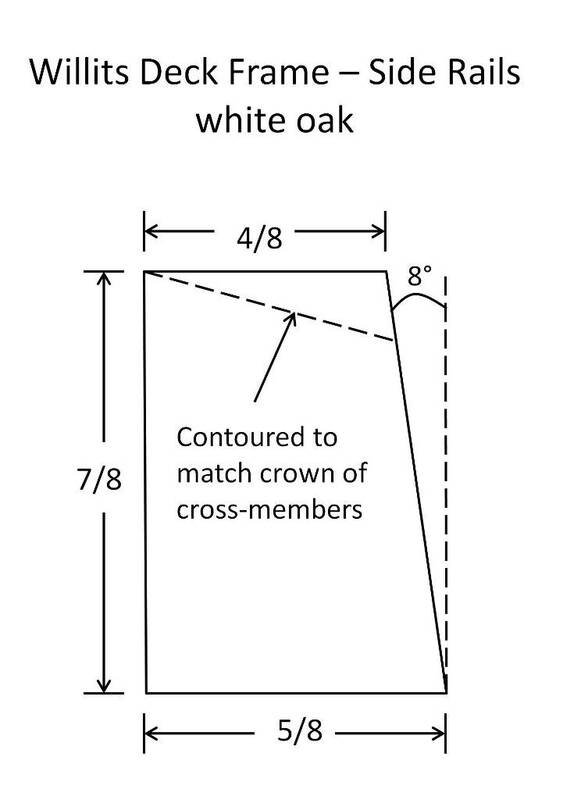 The side rails of the frame are white oak while the cross members are spruce. This particular frame requires new side rails. New white oak stock is cut wide enough to create both rails from a single piece once it is bent to the correct shape. A bending form is created that is 3″ (76 mm) wide. The oak stock is soaked for three days, steamed for 60 minutes and bent onto the form without a backing strip. Let the wood dry for a week. Once removed from the bending form, saw the new stock into two pieces on the table saw and cut to rough dimensions. The left and right frame rails are mirror images of each other. Be sure to label them to avoid errors further on in the process. Line up the new pieces with the original rails and mark them out for later fitting. Remove the original rail on one side and install the new piece. 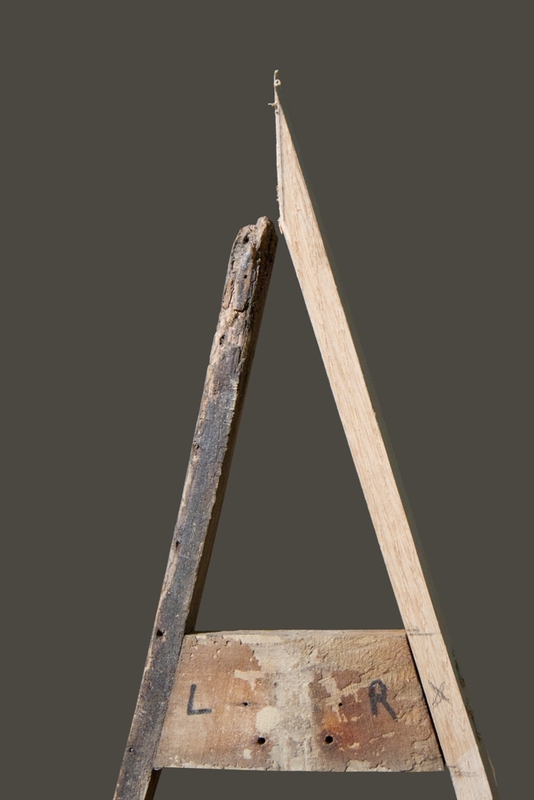 Align a straight edge down the centre-line of the frame and mark the end of the new piece. Use a dovetail saw or Japanese crosscut saw to cut just outside the line. Remove the original rail on the other side. Dry-fit the new piece and mark the angle for the end of the frame. Cut on the outside of the line, dry-fit the new piece and make adjustments until the rails fit together properly at the end. Install the second rail and secure them together at the end with a ¾” 16-gauge bronze ring nail. 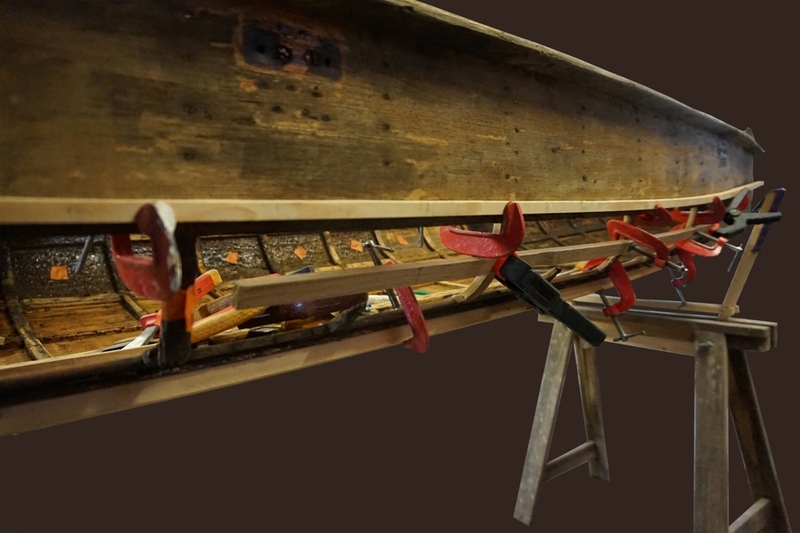 Dry-fit the deck frame in the canoe and hold it in place with several spring clamps. 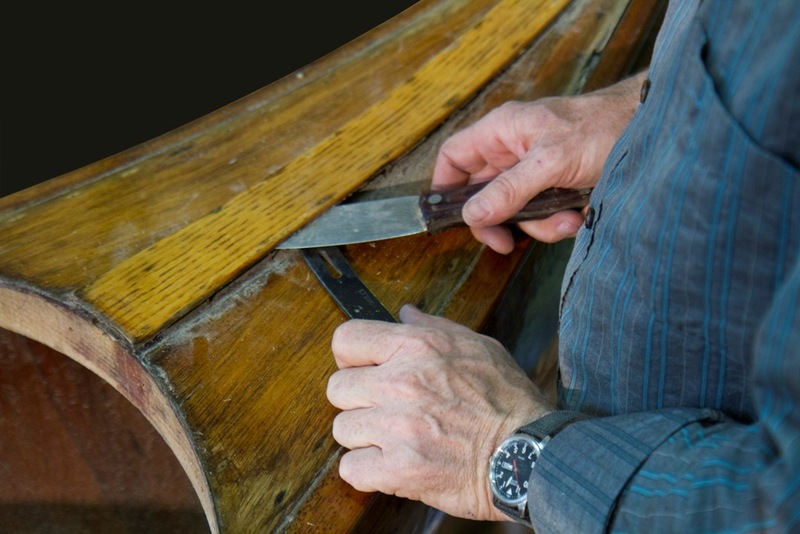 Trim the end to fit and carve the final shape of the side rails until they are flush with the sheer-line of the canoe. This step is critical to the final fit of the deck. 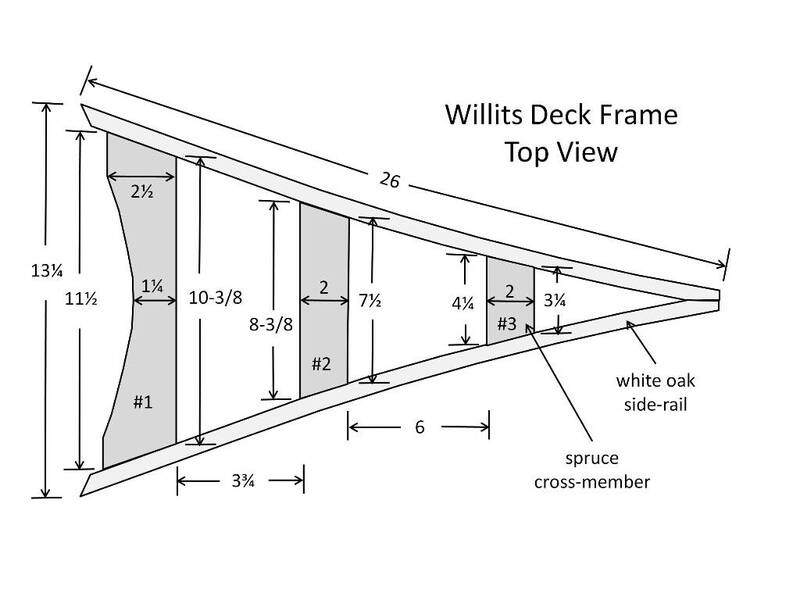 In a solid-wood deck, the shape can be fine-tuned after it is installed. 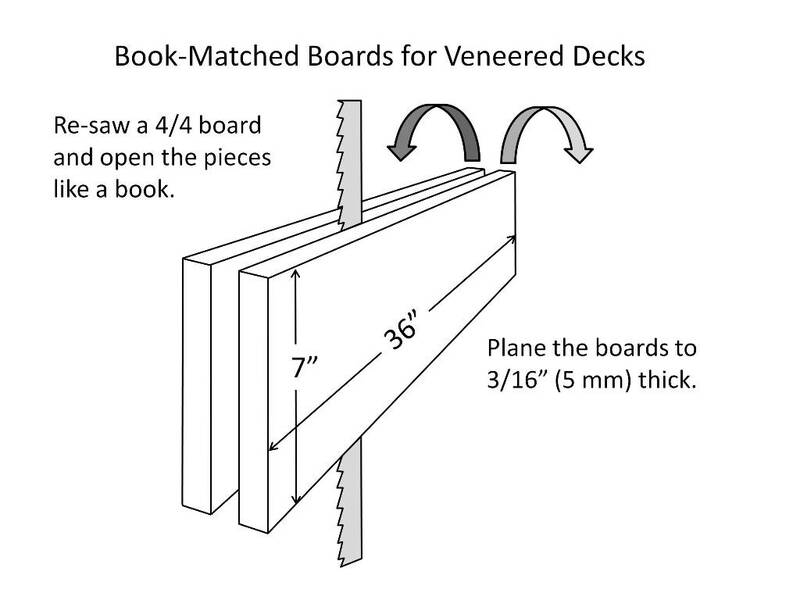 In a veneer deck, the frame must be shaped precisely before anything else is done. I found this out the hard way. The first time I dry-fit the frame, I shaped the end to be flush with the stem-top. This was about 3/16″ (5 mm) higher than the sheer-line of the hull. When I went to install the finished deck, the assembled end rose above the stem-top and did not fit properly. I had no choice but to take the entire thing apart and carve the frame to be flush with the sheer-line. 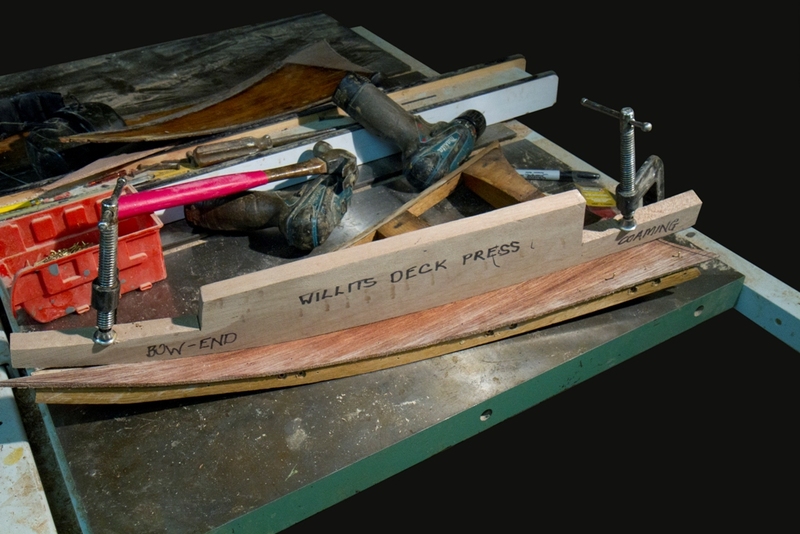 The Willits brothers book-matched their veneers for the decks. 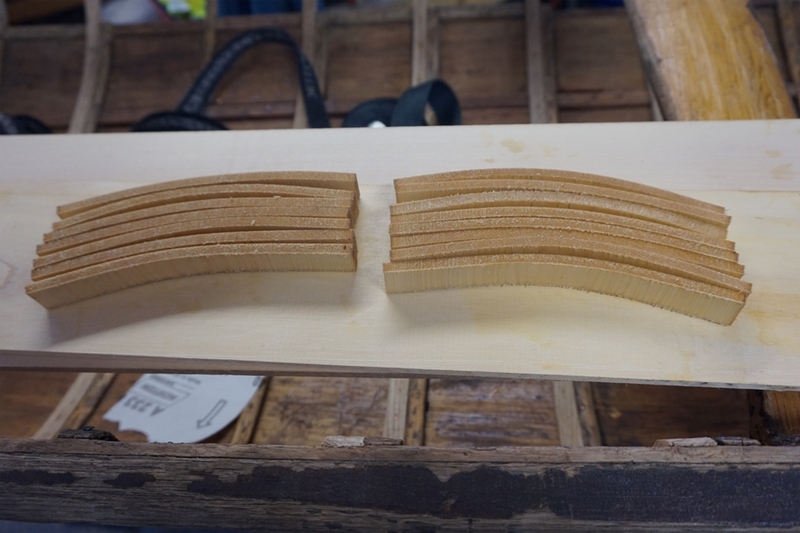 They re-sawed a 4/4 (1″ or 25 mm thick) board on a band saw and opened the pieces like a book. The veneers were planed to 3/16″ (5 mm) thick. Use a mahogany board 7″ (18 cm) wide and 36″ (91 cm) long. 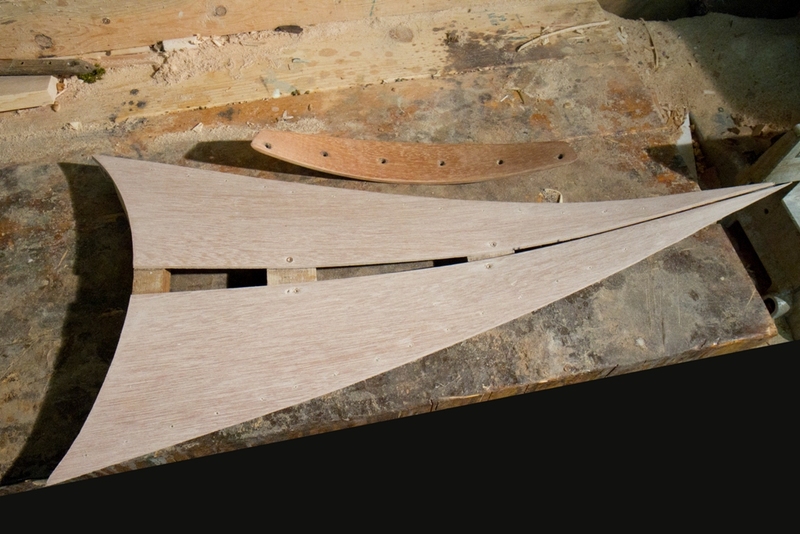 Once the boards are re-sawn and planed, use the original veneers as templates. Mark out oversized pieces and cut them to rough shape. Be sure to cut well outside the lines. You want to have lots of room for fitting and trimming to final size. Make a veneer press jig with 4/4 hardwood. Soak the veneers for at least four hours. Take one of them and pour boiling water over it. Press the veneer into place and use the veneer jig (locked in place with a couple of C-clamps) to act as another pair of hands while you secure the veneer with fasteners. Be sure the veneer extends at least 1″ (25 mm) past the outside edge of the frame. Drill pilot holes in the spruce cross members #2 and #3. 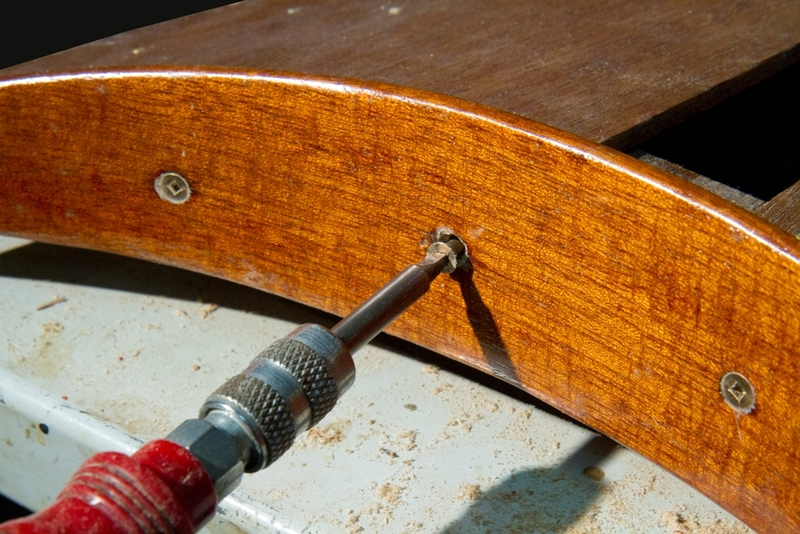 Attach the veneer with ¾” (19 mm) #6 bronze flat-head wood screws close to the edge nearest the centre-line. 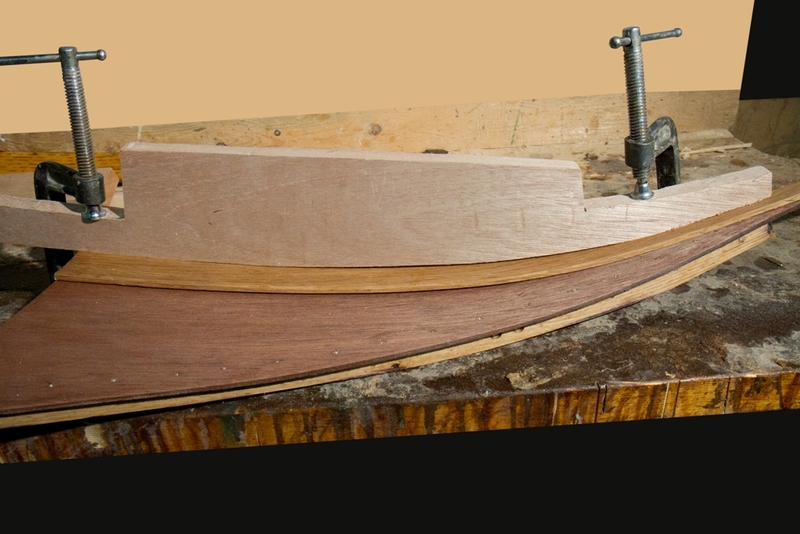 Reposition the veneer jig to allow full access to the outer edge of the deck. 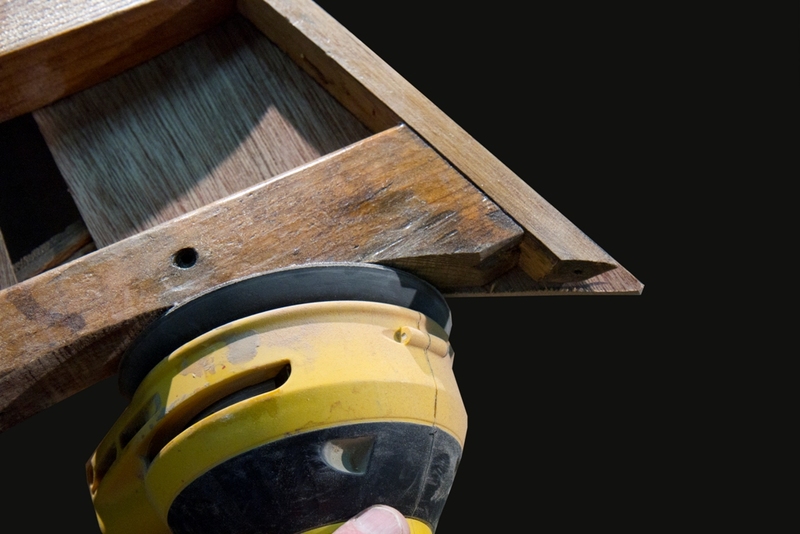 Drill pilot holes through the veneer and into the frame rail at 1½” (38 mm) intervals. 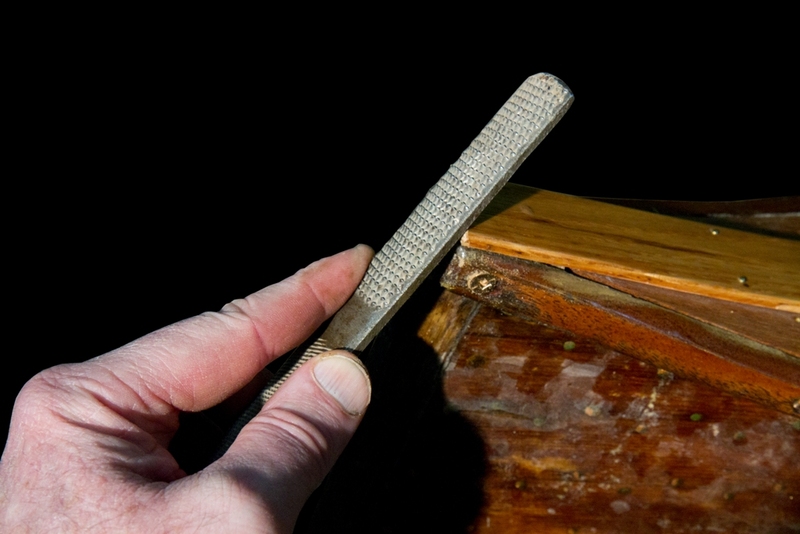 Use a small, flat-head tack hammer to drive ¾” (19 mm) 18-gauge brass escutcheon pins into the veneer. I started with my regular canoe tack hammer which has a large, domed face. I switched over to the small, flat-faced hammer after mis-hitting several pins and bending them. 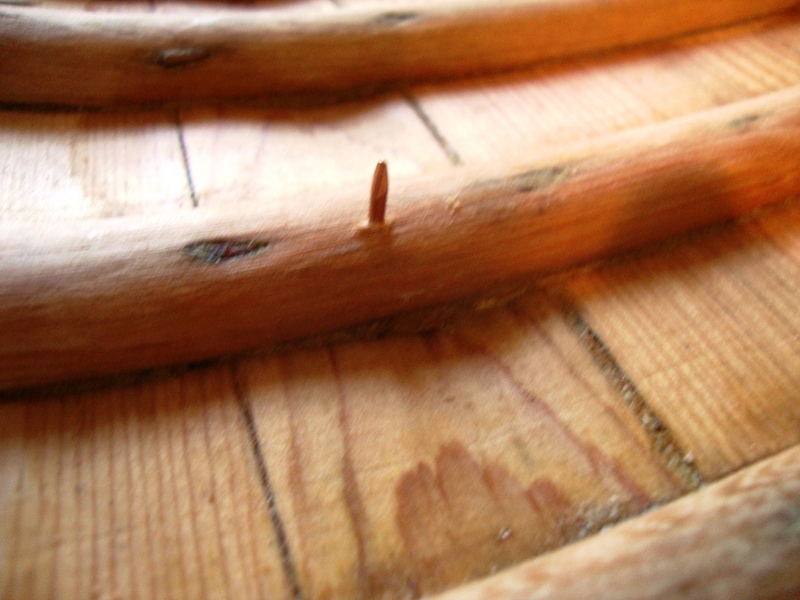 The Willits brothers countersunk these pins and filled the holes with wood putty. I opted to skip this step after my counter-sink slipped and split the veneer (not once, not twice, but three times before I tore off the veneer and started again). This process offers no end of challenges, the least of which being the fact that the drill bit is 3/64″ (1.2 mm) diameter and the holes are drilled free-hand. If you are anything like me, you will need at least one more drill bit than you have on-hand (I used six drill bits to attach six veneers and two king planks). If your fingers are as big and clumsy as mine, use a pair of forceps to hold the pin while you hammer. Once the veneers are attached, dry-fit the deck. Mark the end of the veneer so the deck fits back into its original position. Trim the ends of the veneer and dry-fit the deck again. If you have done everything right so far, the top of the veneer will be flush with the stem-top. Mark the outside edge of the canoe hull on the underside of the veneer. Remove the deck and carefully shape the veneer to just outside the line. Repeat the process of dry-fitting, marking and shaping until the veneer fits precisely. 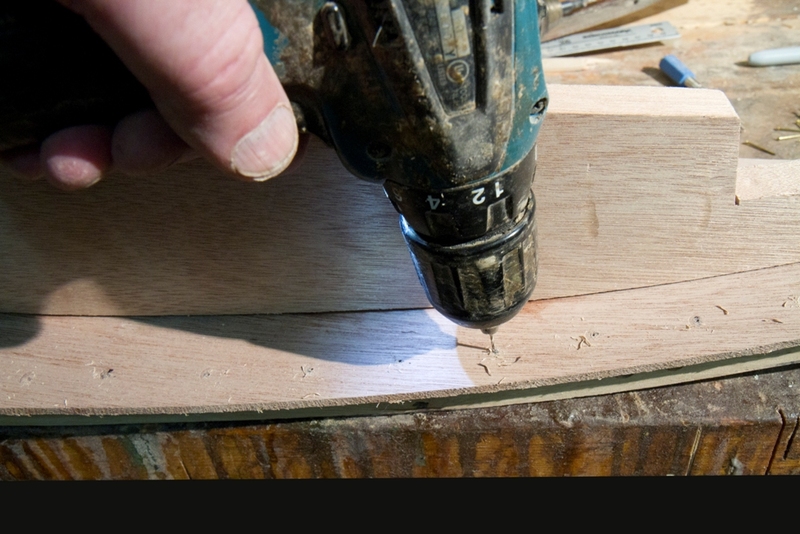 Use a random-orbital sander to shape the end-grain veneer until the coaming fits precisely. 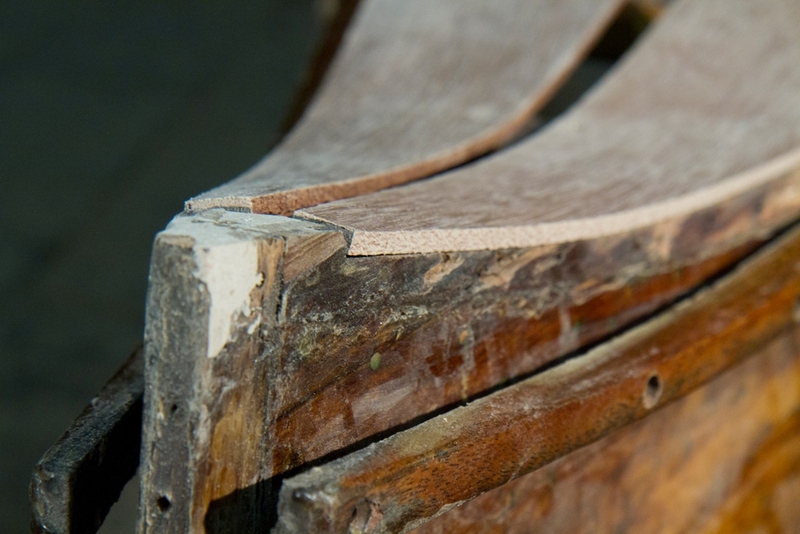 This too, is a slow process of shaping and dry-fitting the coaming in small, careful steps. The veneer is extremely delicate and prone to breaking (especially at the corners). I switched to a fine rasp as I got closer to the final fit. Sand the veneer by hand from 120-grit to 220-grit. Wet the veneer surface and let it dry. This will raise the grain. Sand by hand from 320-grit to 600-grit. Use a tack cloth to remove lingering dust once the sanding is complete. 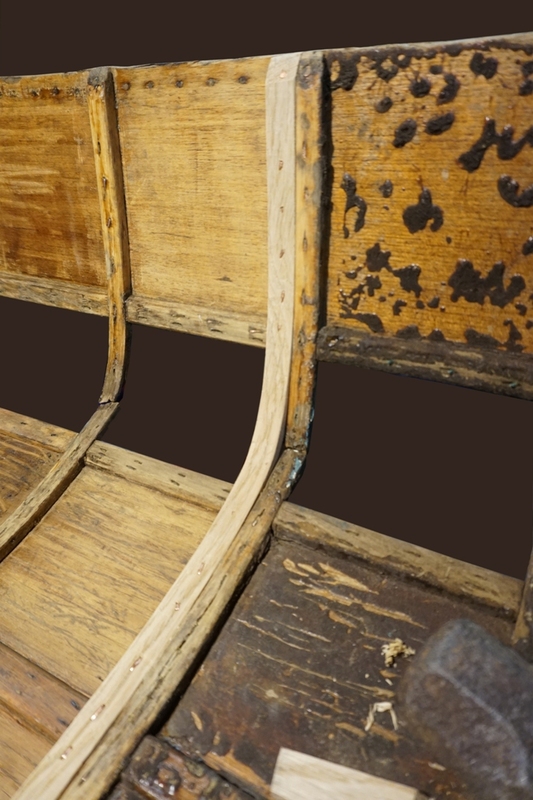 Stain the veneer to match the original wood in the canoe. 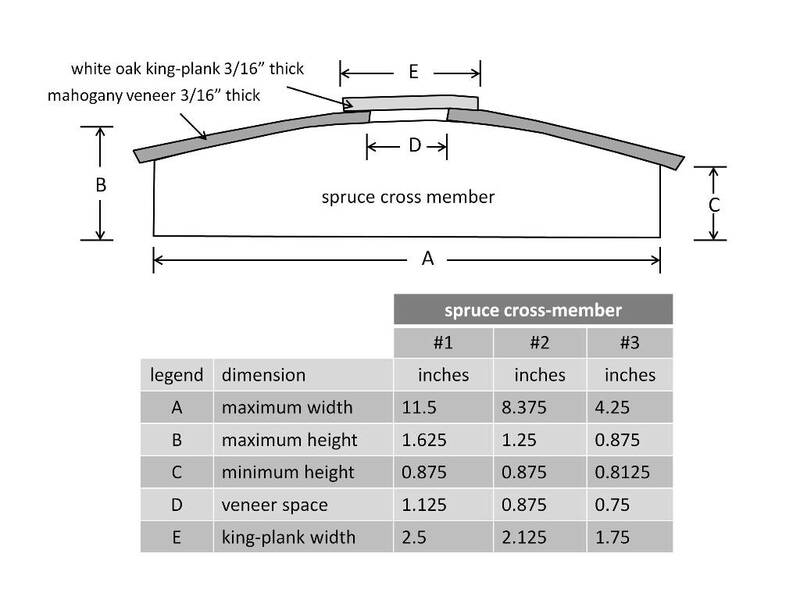 Prepare a piece of white oak for the king plank. Sand it to 600-grit and stain the wood to match the original. Seal all of the frame components with shellac (2-pound cut using lacquer thinner instead of methyl hydrate). Then apply a coat of spar varnish (thinned 12% with paint thinner). Allow the varnish to dry for a couple of days before proceeding to the next step. Press the king plank into place and use the veneer jig to hold it in place while you secure it with escutcheon pins. Drill pilot holes and hammer escutcheon pins at 2″ (50 mm) intervals. Use a clinching iron to dub the pins at the back of the deck. Dry-fit the deck in the canoe. If you have done everything right so far, the king plank sits snugly on top of the stem-end. 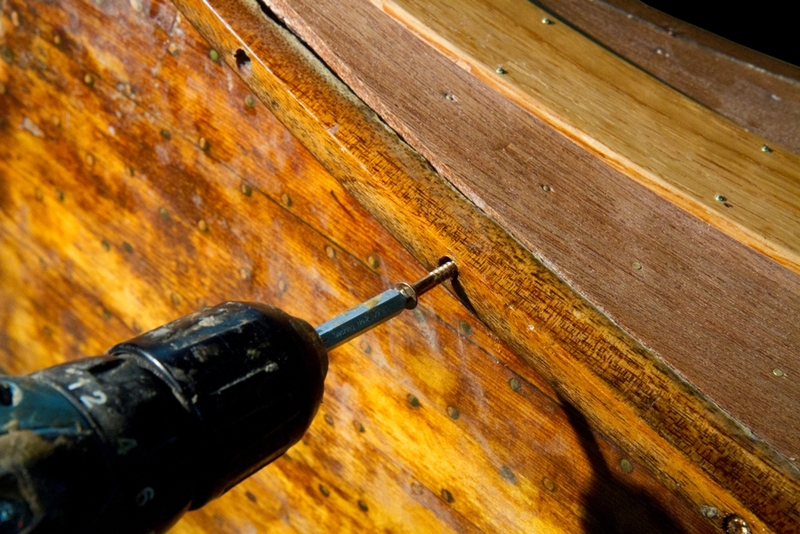 Attach the coaming to the deck with ¾” (19 mm) #6 bronze flat-head wood screws. 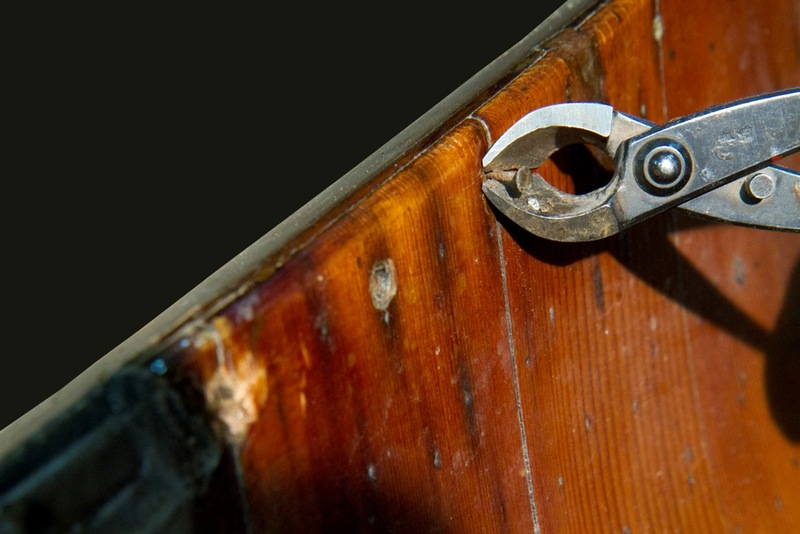 Install the completed deck and secure it with ¾” (19 mm) 16-gauge copper canoe nails. 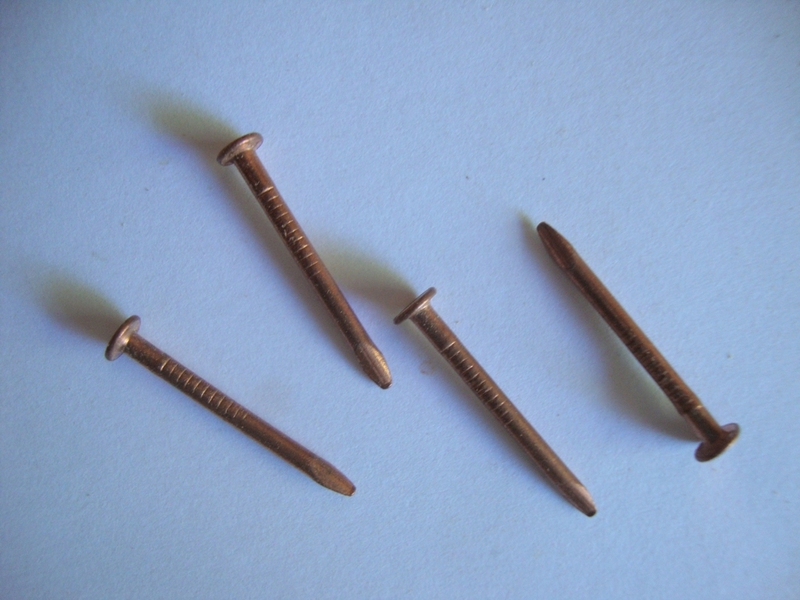 Re-attach the outwales with #8 bronze flat-head wood screws. Spray the screws with a little WD-40 to reduce heat build-up as they are driven in. Hot screws are more likely to break off as they are driven tight. 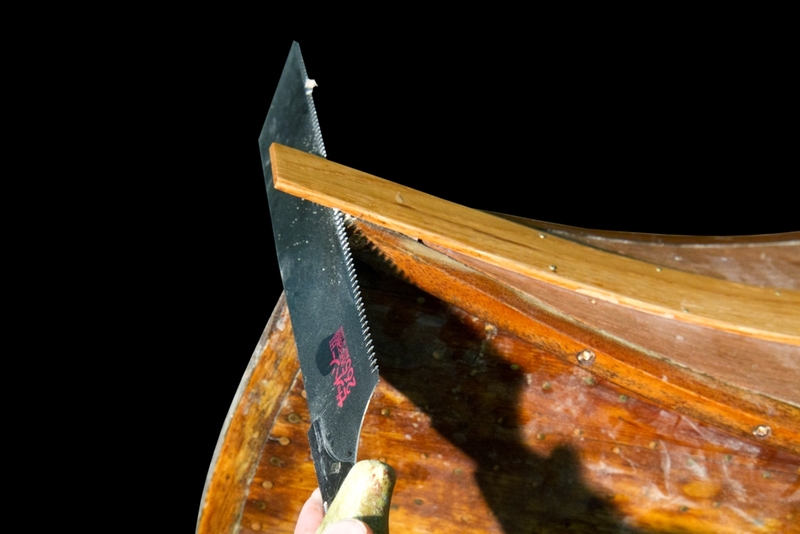 Use a Japanese cross-cut saw to trim the king plank flush with the outer edge of the stem. Smooth the corners of the king plank at the end with a rasp. 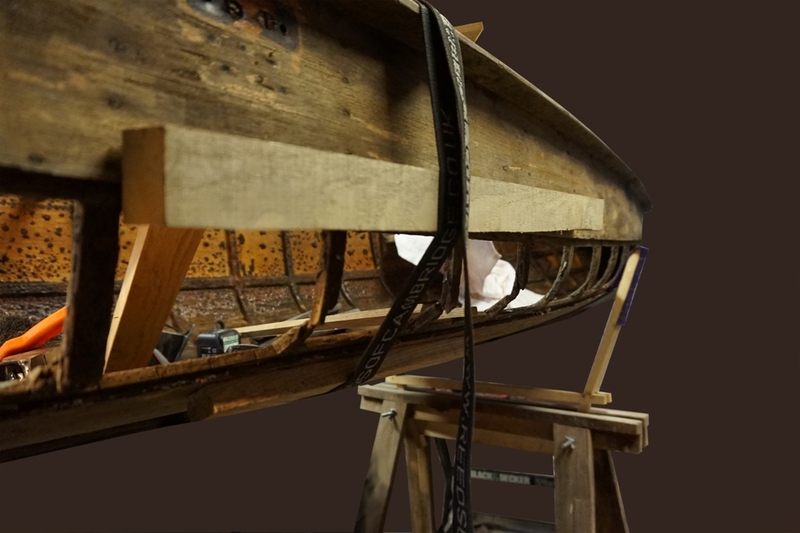 Note: In 2016, I put out a call for someone with a wide-board raised-batten canoe to bring it to my shop in British Columbia, Canada for me to restore and document as part of my second book ̶ “This Fancy Old Canoe”. I was contacted immediately by Sam Browning. 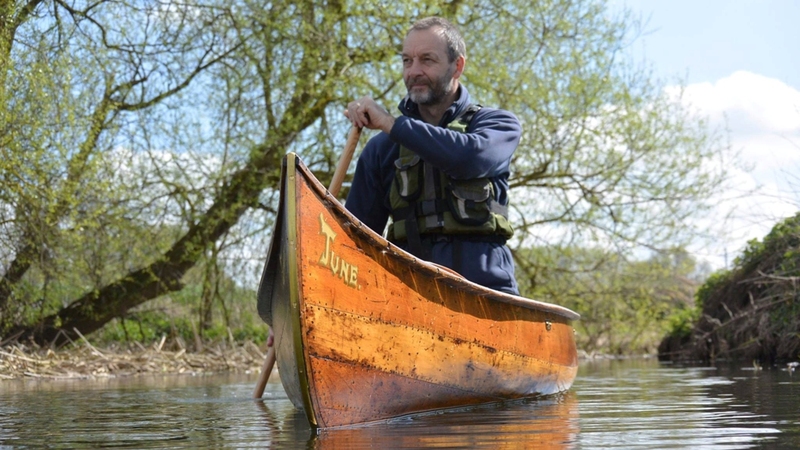 He was about to start restoring one of these canoes. He offered to take pictures of the project as he worked. I offered to come to his shop to see the canoe and meet him in person until he let me know he lived in Ely, Cambridgeshire, England. A few months later, I received a USB flash drive in the mail from Sam. 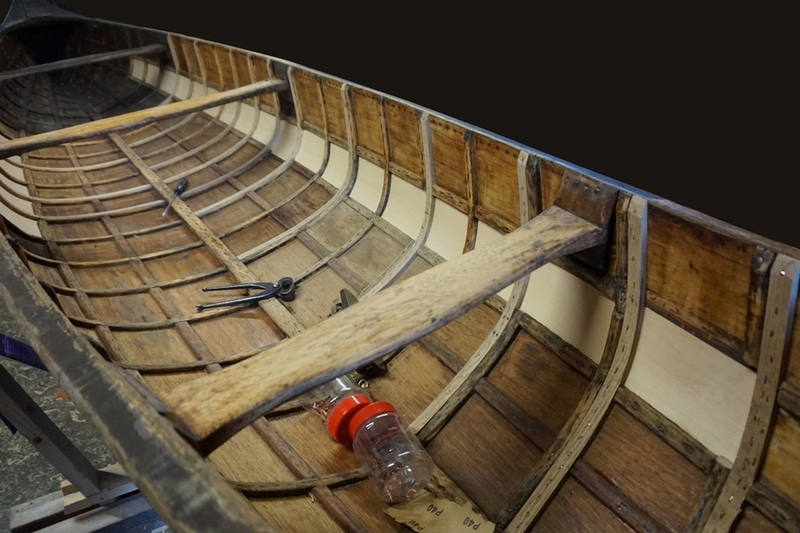 It contained 300 images and a copy of the posts he presented on the ‘Song of the Paddle’ web forum as he documented the restoration. For my blog (and eventually my book), I have edited Sam’s posts and added a few notes of my own (presented in italics). For this article, I am presenting the wide-board repairs. Many thanks to Sam for his excellent work and generous contribution to my book. My plank repairs consist of three boards that need to be replaced. 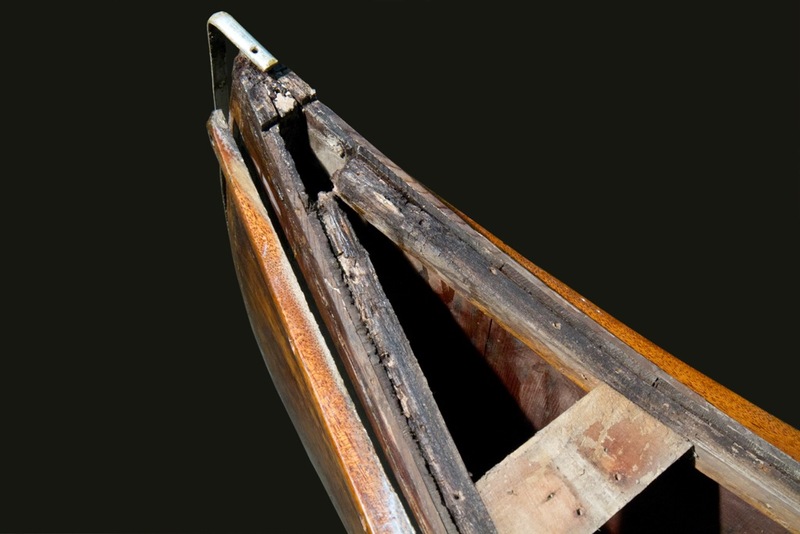 There is a small piece missing from the bilge-plank at the stern. It starts at the last rib and runs to the internal stem. 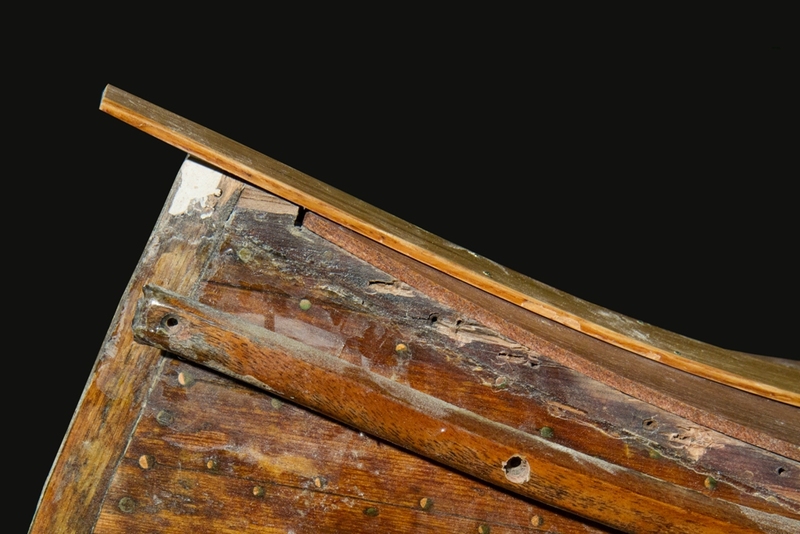 The second is a bilge-plank on the port side spanning across six ribs and the third is a long bilge-plank on the starboard side spanning across 17 ribs. My plan is to do the repairs in order from smallest to largest in order to learn on the small repairs and hone the process for the Big One. 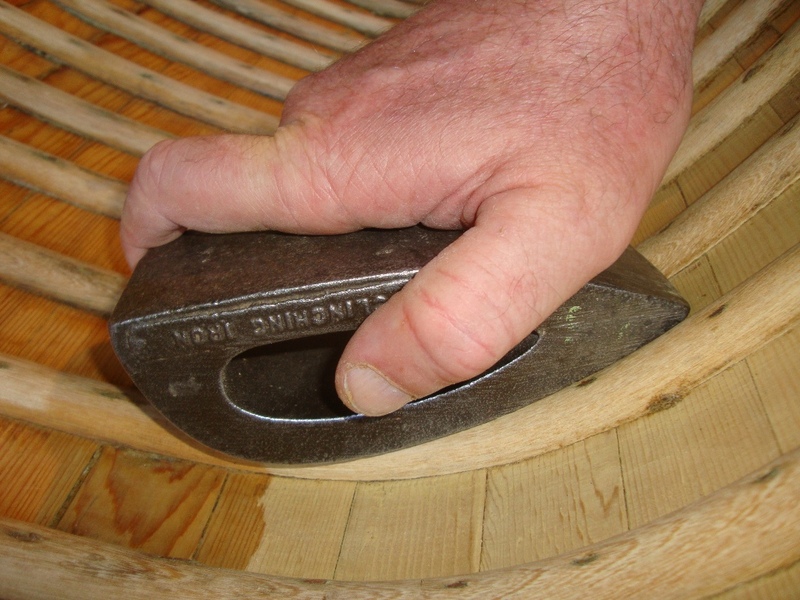 Copper canoe nails (16-gauge 1″ or 25 mm long) are harder to get out than tacks on a cedar-canvas canoe as they are driven through a basswood (or Spanish cedar) plank as well as rock elm ribs before being bent over (dubbed) and clinched. The nails aren’t tapered either (apart from the point) and they hold well despite their age. Getting rid of the heads and punching them through to the inside works best. 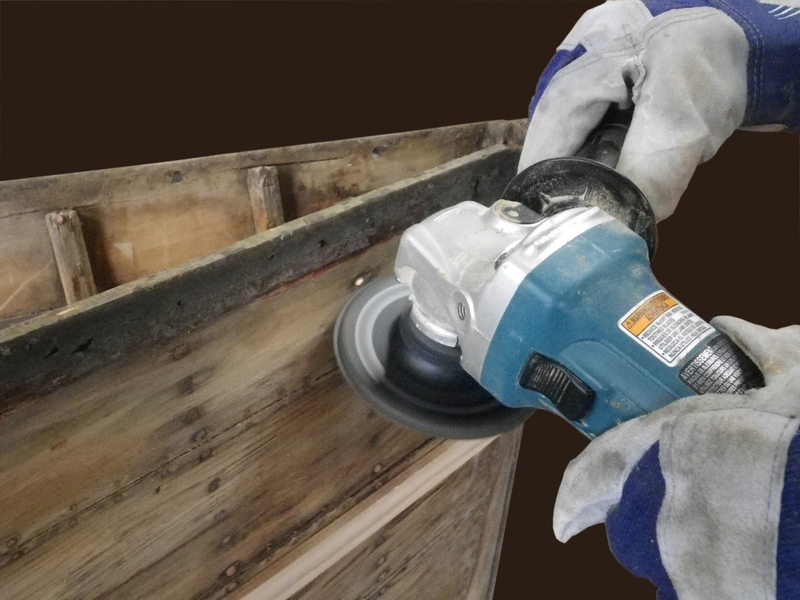 I use an angle grinder set up with a 24-grit sanding disk to grind off the heads of the copper nails. Care must be taken to ensure that only the board to be removed is touched by the grinder. For the first repair, I tidy up where the new piece of plank has to start, removing nails and chamfering the edge so that the new nails will go through both the new and existing wood. 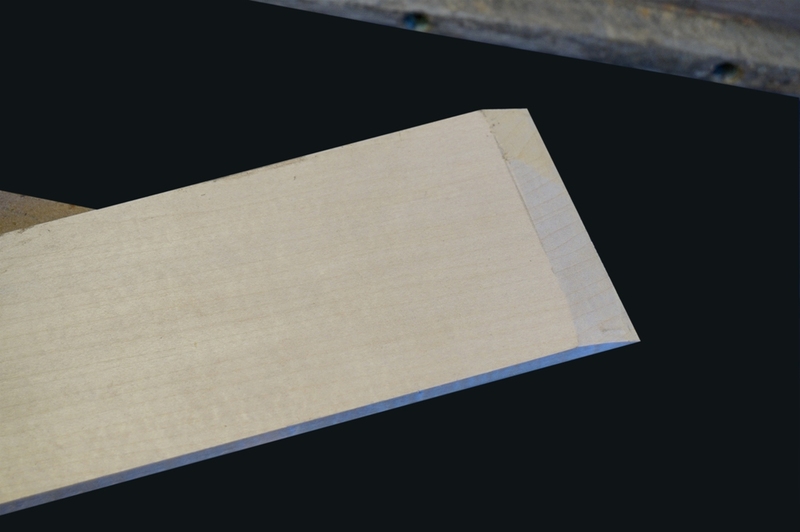 The new plank is a piece of basswood cut carefully to its final dimensions and planed to match the thickness of the original boards (¼” or 6 mm). The end of the new plank butts up again the existing board and laps over it with a chamfered edge to match the chamfer on the existing board. When I am happy with the fit, I drill pilot holes for the canoe nails at the join and push them through from the outside. 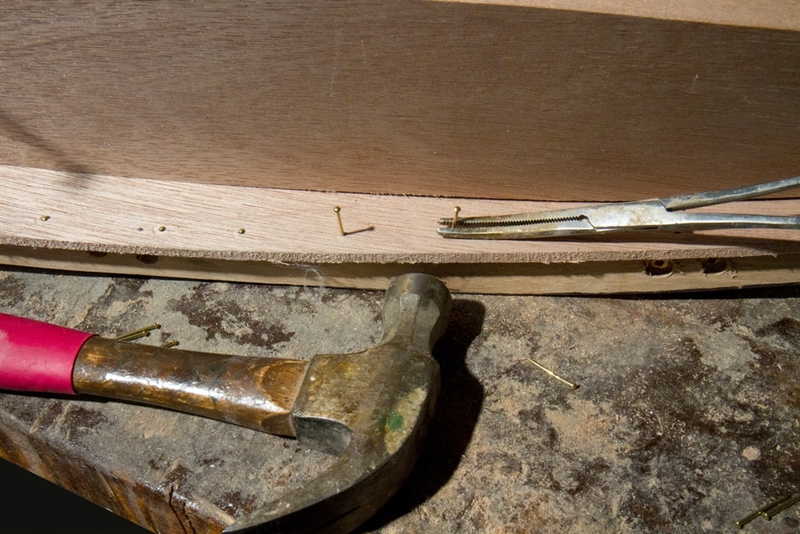 Next, whilst pushing them firmly from the outside, I bend (dub) the nails over with a clinching iron. I wet the outside of the new plank with hot water so the nails sink into the wood without doing any damage. Then, while holding a clinching iron on the bent nail inside, I hammer the outside until the nail is flush with the surface. I repeat this along the top and bottom edge as well as two rows of nails in the stem. The end of the new plank extending past the stem is trimmed to complete the job. I now turn my attention to the second plank repair. Because of what I’ve done already, I’m confident about the nailing procedure. For this repair, I have to learn to fit a plank that bends in two directions. In the factory, the planks would have been cut from patterns which (sadly) are not available to me. 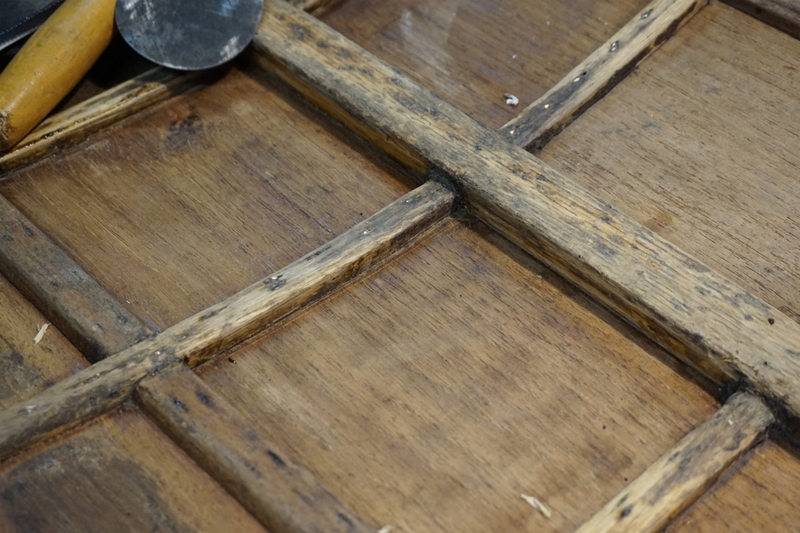 When the flat shape had been cut, the outside of the plank was soaked with boiling water poured over it. This swells the grain causing it to cup until the correct curve was reached. Then, it was nailed into place. 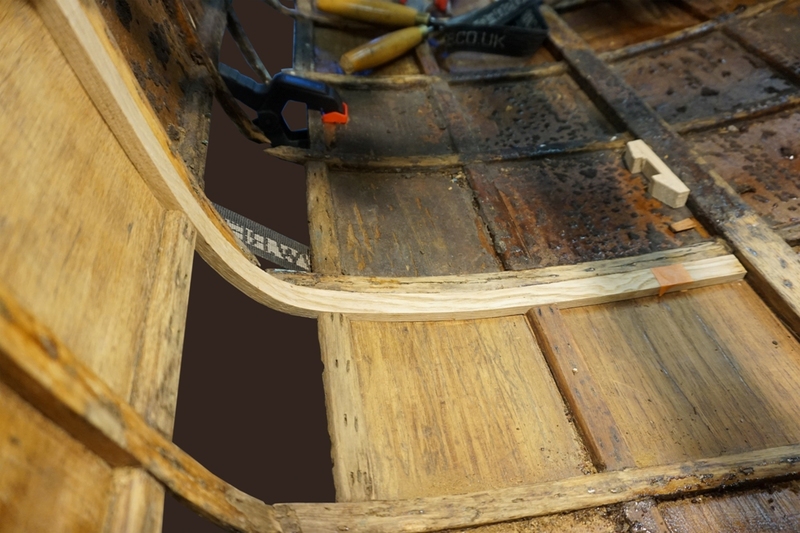 My plan for the repair is to cut the plank oversize, hold it in place with a strap at each rib, then pour boiling water over it to cause it to curve. As it bends, I should be able to tighten the straps and hold it in place until it dries. I will then mark out the dimensions of the gap and work from there. 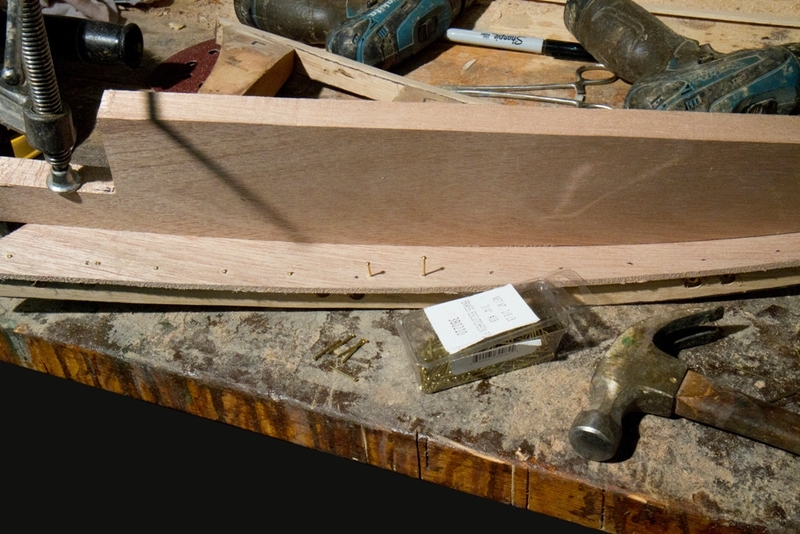 The first step is to fit basswood strips onto the outside surface of the exposed ribs. These spacers create a flush surface upon which to bent the oversized plank. To make spacers, I cut strips and poured boiling water over them. They bend into a suitable curve with very little pressure. I then tape the spacers into place. I chamfer the edges of the old plank so the chamfer on the new plank fits precisely and allows a line of nails to go through both. 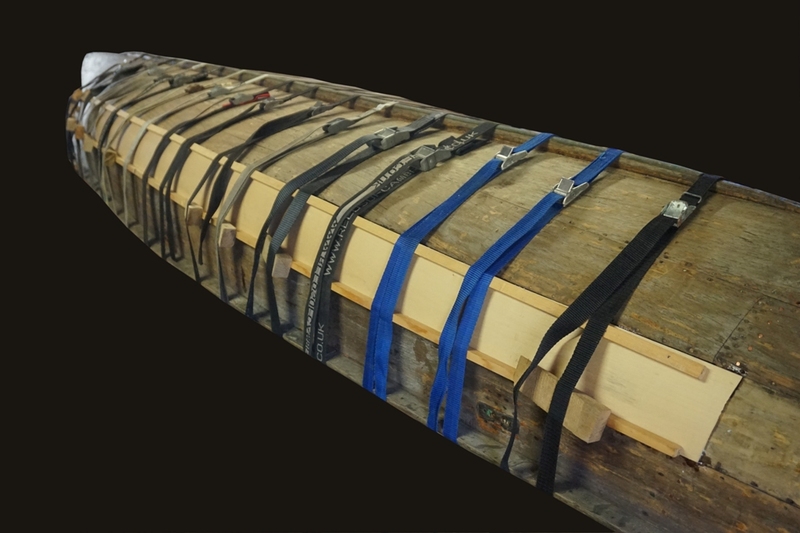 To spread the tension from the straps evenly along the new plank, I put battens along the both the top and bottom edges. I use steam from a wallpaper stripper rather than pouring boiling water to help the plank curve into shape. Two people would have made things easier, but after holding the steamer in place for a minute or so, then moving it along the plank and holding it with my knee, I am able to pull the straps progressively tighter. I work my way up and down the plank until it is tight against the hull along its full length. At both ends, I use ratchet straps and a couple of wedges to hold the curve tight to the hull. I allow the plank to dry for a couple of days. Before I remove the straps, I clamp some blocks under the plank and at the ends. These act as reference points so I can put the plank back in exactly the same place while I mark, trim and fit the top edge. A planking gauge is used to mark the position of the gap’s edge even though the plank covers it and I can’t see. 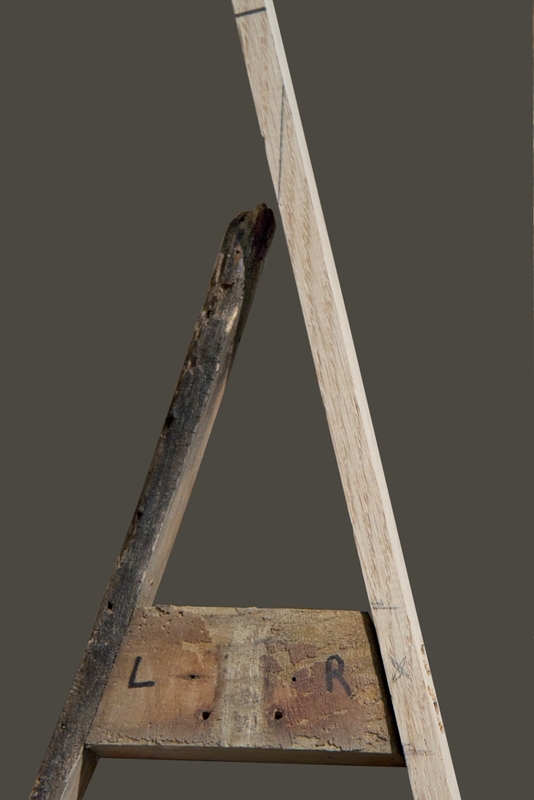 The ‘L’ part of the gauge slides behind the plank and is moved along the edge of the gap while a pencil sits in the notch and draws a line. 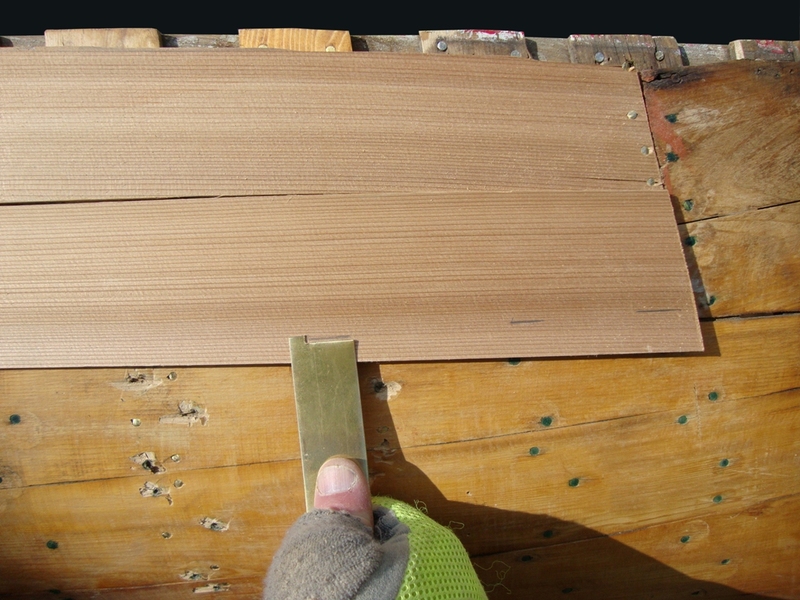 Once the plank is marked, I use an apron plane to bring the plank dimension down to just outside the line. Then, a series of testing fitting, shaping, fitting, shaping until I have it just right. Then, the inside edges at the ends were chamfered to match the existing planks. The whole process takes about two hours before I am happy with it. I run a line of masking tape above and below the gap. On the tape, I mark where the ribs are so I can drill from the outside and place straps and blocks just to the sides of the ribs. This way, I can get the nails in, dubbed and clinched without worrying about the straps being in the way. 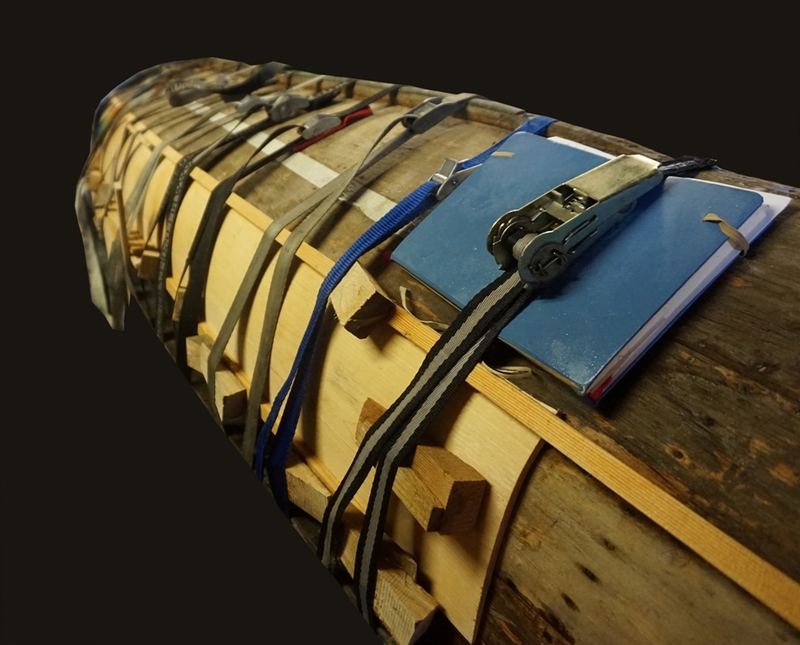 I nail the ribs, five in each, with a double row on the ends, then along the top and bottom edges into the battens – about 90 nails in all, drilled, pushed through, dubbed and clinched. With the process honed, I turn to the Big One. I begin by making 16 basswood spacers for the ribs. I steam and tape the spacers to the ribs. 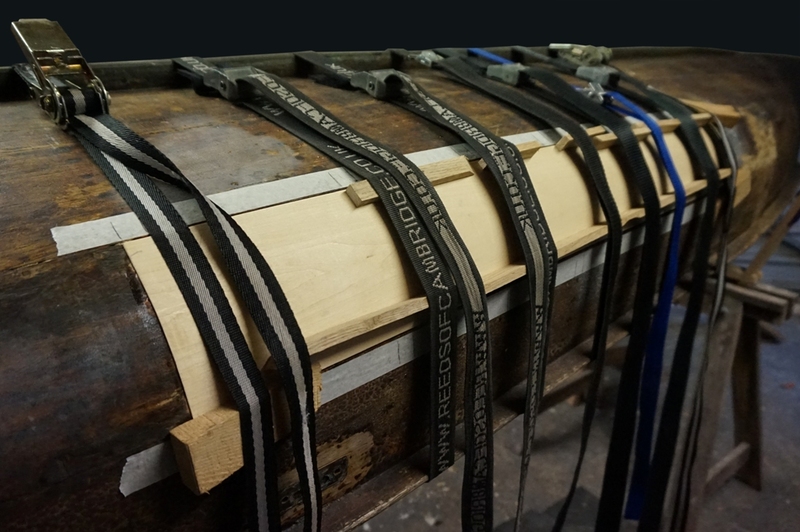 I make two 12′ (3.7 meter) battens, arrange 16 straps and two ratchet straps. I make an oversized piece of basswood to fit over the gap. I steam the plank and tighten the straps, then steam and tighten again. I check to make sure it is all tight with no gaps showing, then leave it for a couple of days. The marking, cutting, fitting, shaping routine is the same as for the second plank. The final fitting and nailing proceeds smoothly. It’s great how once you have done a job, you wonder what all the fuss was about. I suppose, at any time, I could have pulled a strap too tight and split a plank. I could have planed too much off and left a gap. A plank could have split while I was nailing. If you need a plank for your board and batten canoe just let me know, I have a spare plank waiting in reserve. 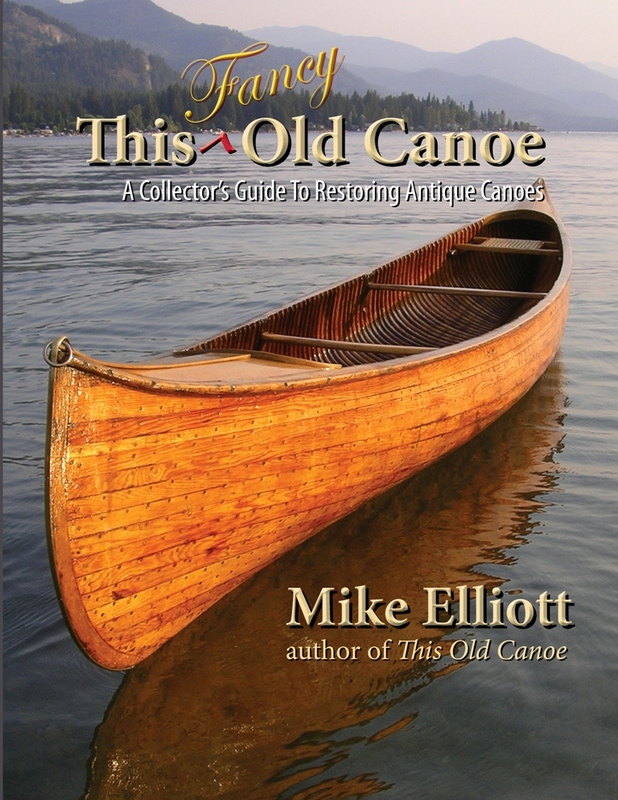 The entire restoration process (including plank replacement) is described in my book – This Old Canoe: How To Restore Your Wood Canvas Canoe. A few months later, I received a USB flash drive in the mail from Sam. 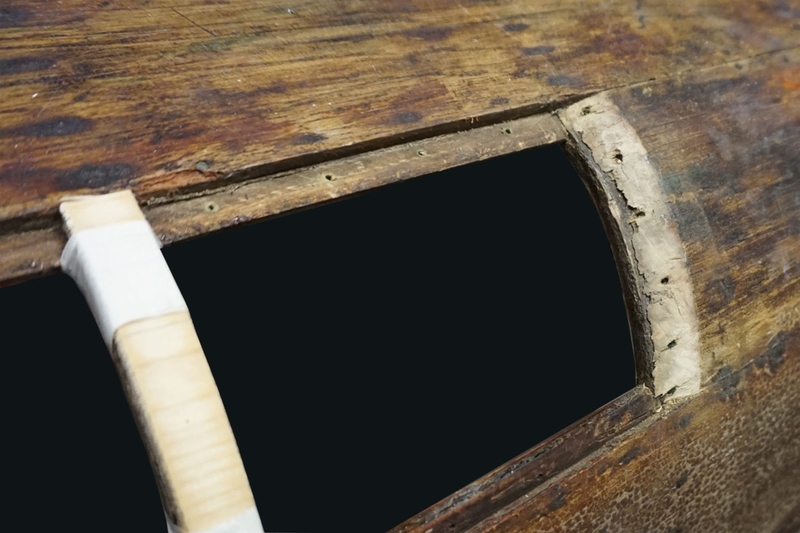 It contained 300 images and a copy of the posts he presented on the ‘Song of the Paddle’ web forum as he documented the restoration. For my blog (and eventually my book), I have edited Sam’s posts and added a few notes of my own (presented in italics). 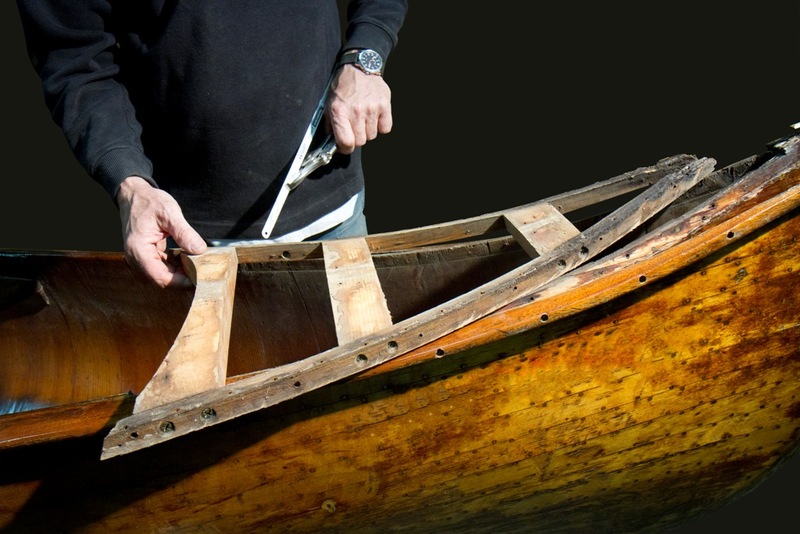 For this article, I am presenting the rib repairs as well as some general history and description of the canoe. 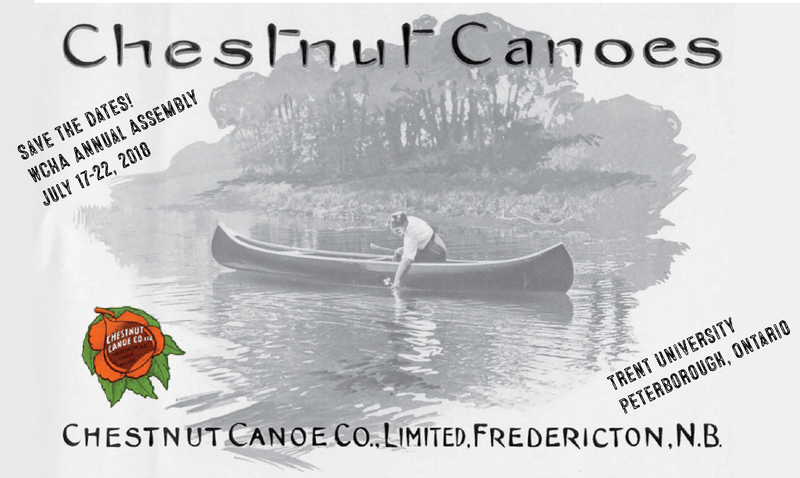 My canoe was made by the Canadian Canoe Company in Peterborough, Ontario. The company started in 1892. 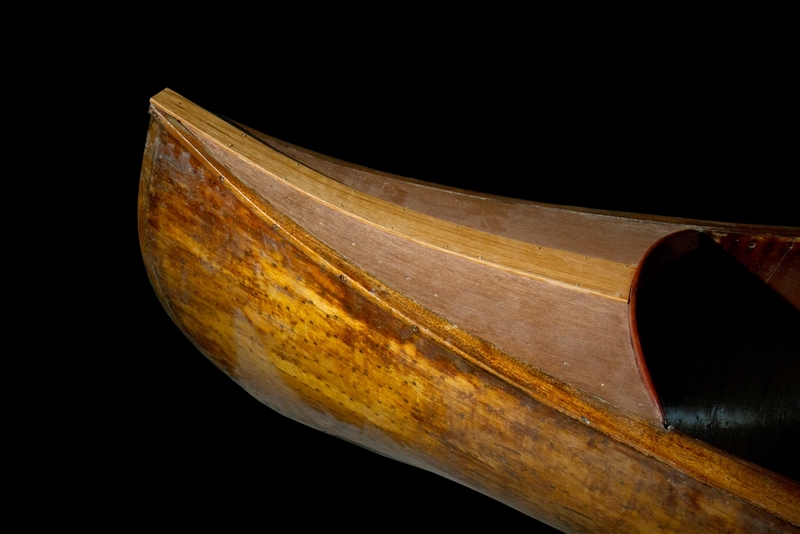 The last canoes of this type were built around the mid 1930’s. 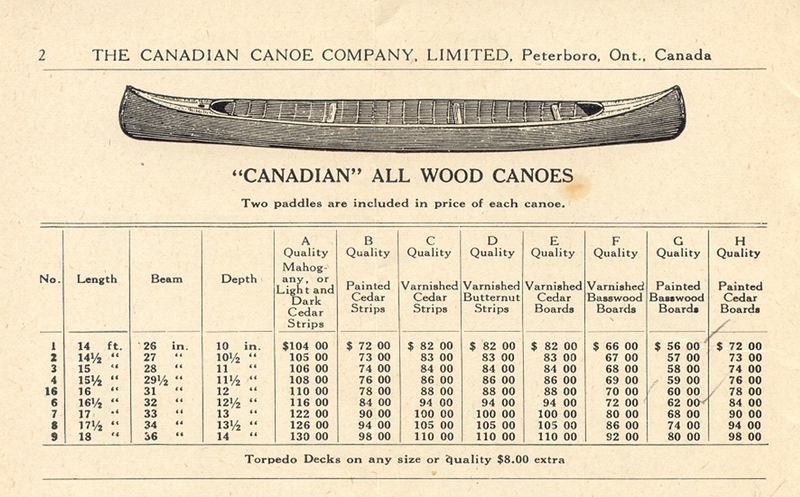 From the 1929 catalogue, my canoe is the 15′ 6″ No. 4 all wood canoe F quality (varnished, basswood boards). It has a 29½” (75 cm) beam and a depth of 11½” (29 cm) amidships. It is interesting to note that the garboards (the two planks on the bottom of the canoe) in my canoe are Spanish cedar ̶ a true mahogany. 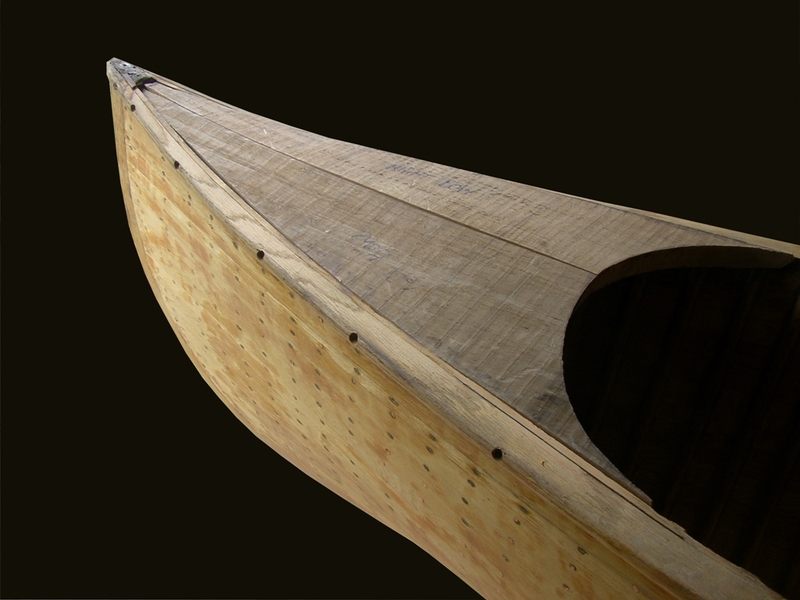 This particular canoe was imported to England by Salter Bros. Ltd. of Oxford. 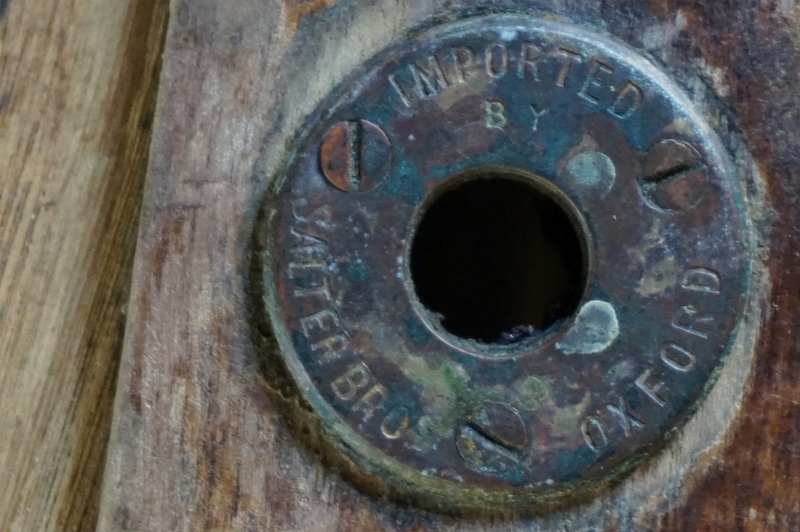 Looking at the Salter Bros. history, they mention importing 21 canoes from Canada in 1930. My canoe may be one of those. 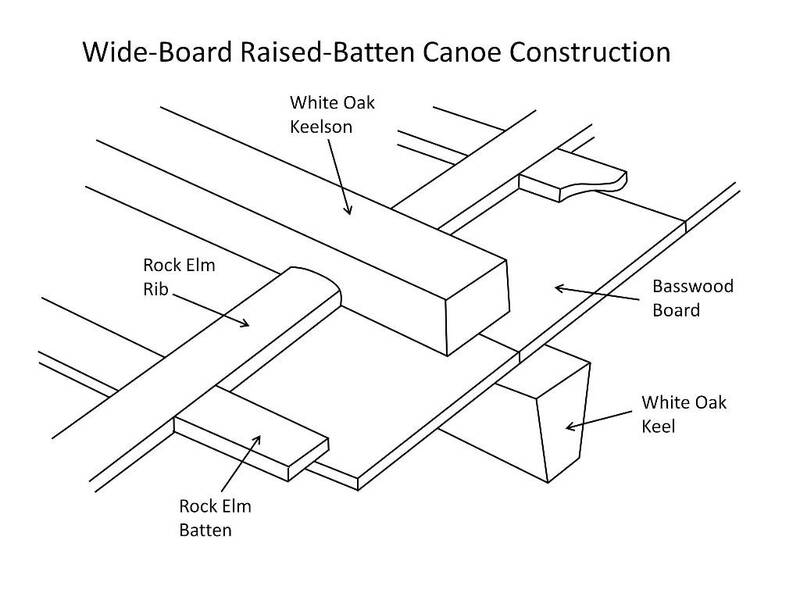 The exact origin of wide-board raised-batten canoe construction on a solid wood form is up for debate, but it was probably developed in a combined effort by Tom Gordon and John Stephenson in 1857. Construction began by laying down a white oak keelson. 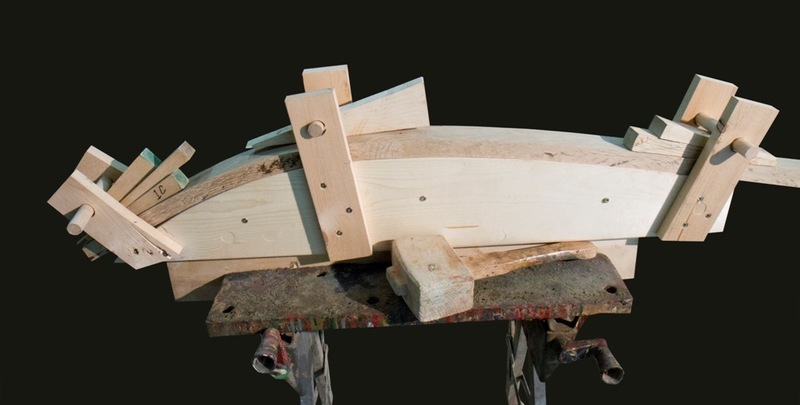 Rock elm ribs were then bent over the form and fitted into notches cut into the keelson. 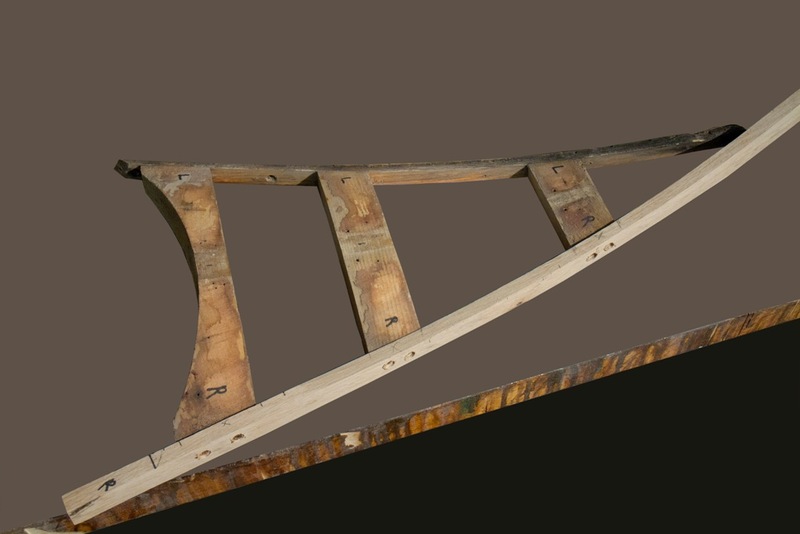 Wide basswood boards (three or four on each side) ran longitudinally and were attached to the ribs with copper canoe nails. 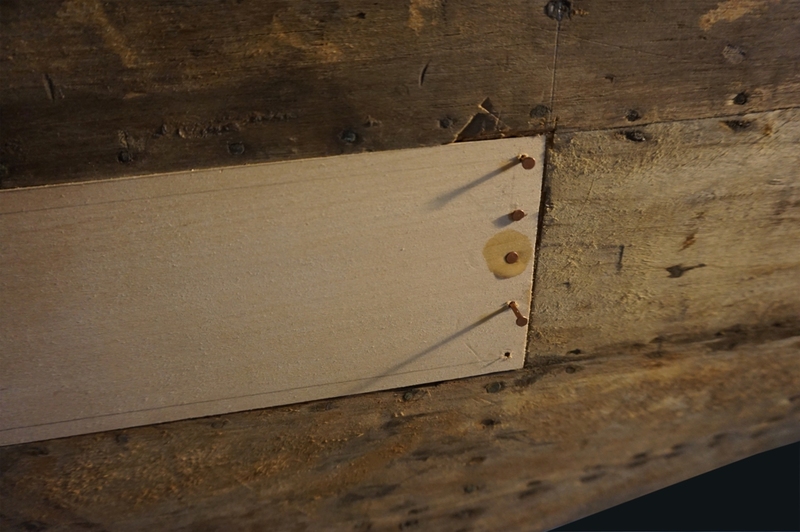 Nail holes were pre-drilled and the nails were driven straight into the solid-wood form. The hull was then pulled free of the form and turned right-side up. 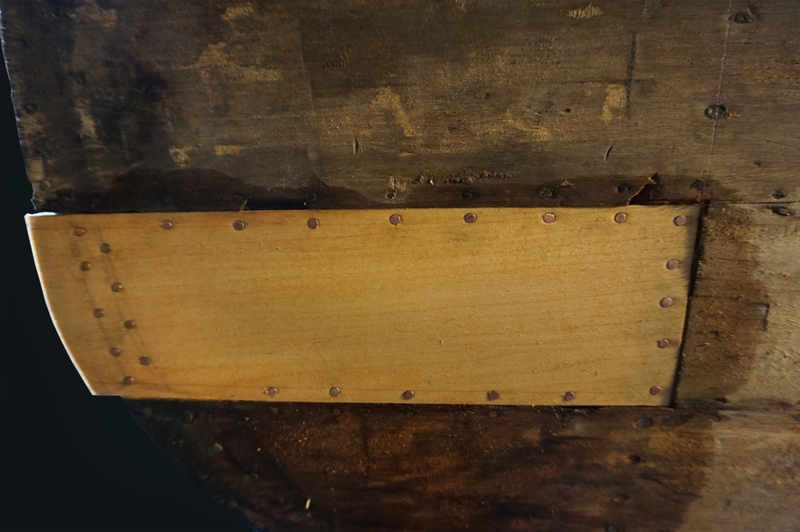 The nails were then ‘dubbed’ (bent over) to lie flat along the ribs (with the points towards the keelson) and then clinched tight with a clinching iron and cobblers hammer. 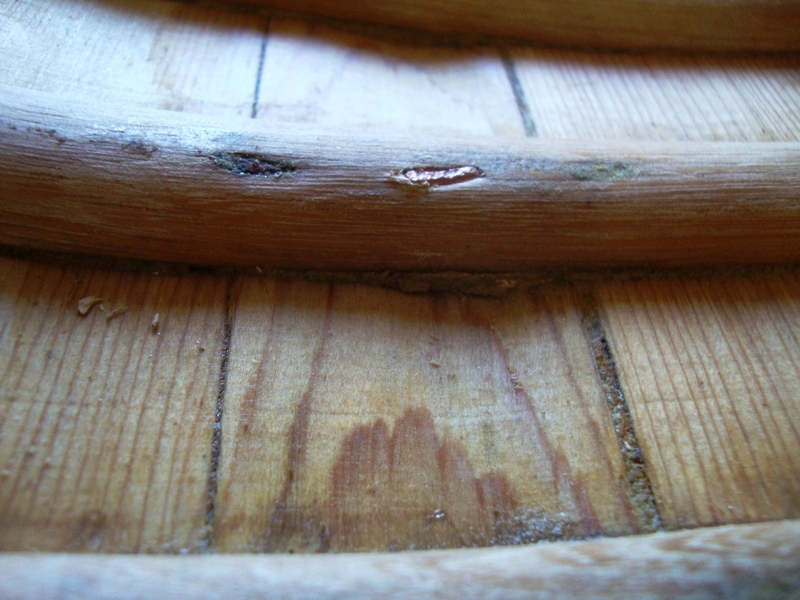 The seams between the basswood boards were covered with ironwood battens between the ribs held in place with copper canoe nails. If this was a cedar-canvas canoe with damaged ribs, I’d just take them out and replace them. 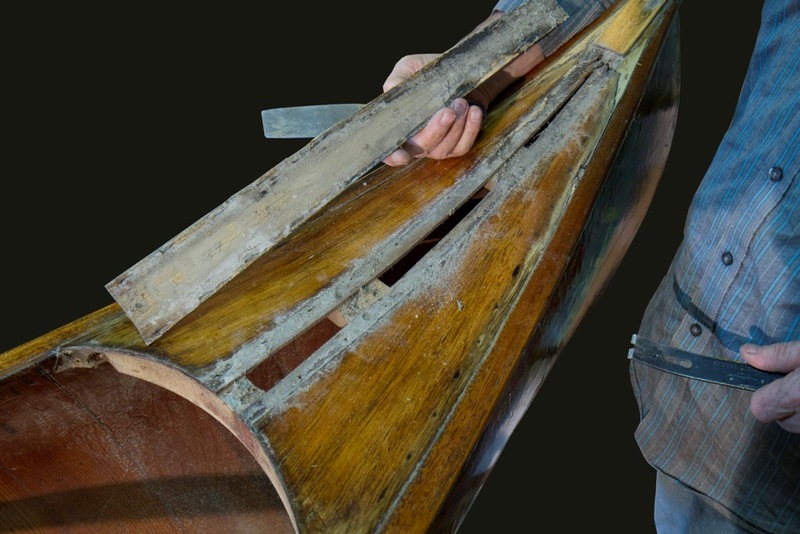 With one of these canoes, you can’t do that without taking the whole thing apart. 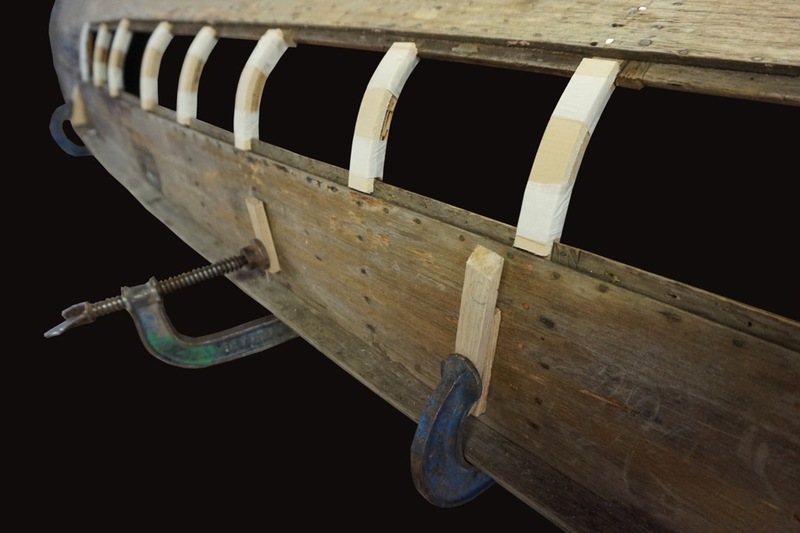 What I plan to do is bend new rib material which will extend from the keelson to the sheer-line and nail it in place alongside the existing rib (this process is commonly used in wooden boat repair and is known as sistering ribs). 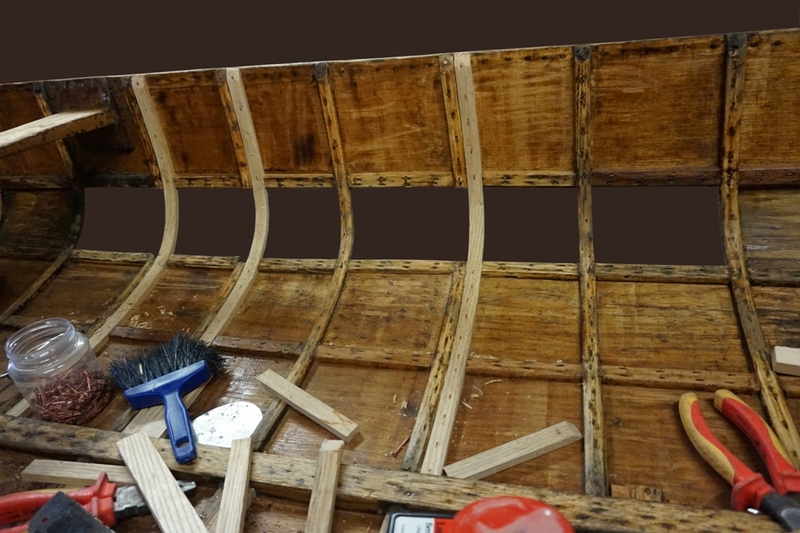 Because the canoe has had broken ribs for many years, it needs a bit of reshaping before I can bend and install the new rib material. 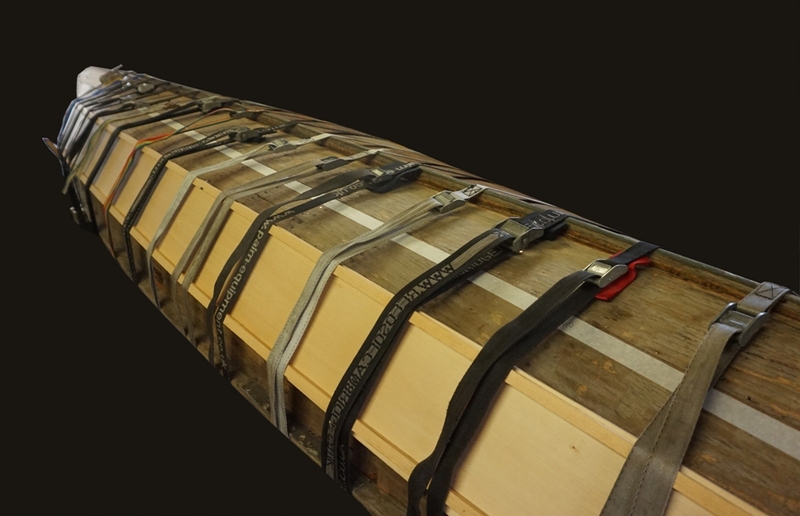 Straps around the canoe with a couple of lengths of timber to push in the right places helps to reshape. I bend the new rib material inside (straight-grained english oak cut to size and shaped to replicate the original before it is soaked overnight and steamed for an hour), on top of the old rib. Any spring-back should result in the right size and curve. 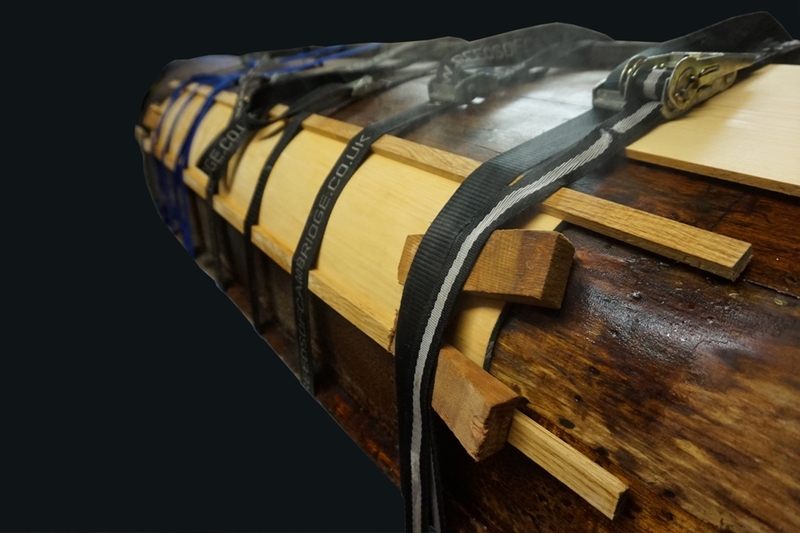 The end of the new rib at the keelson is held in place by a scrap piece of hardwood wedged between it and a length of timber positioned above the keelson and clamped on top of the thwarts. The rest of the new rib is held in place with g-clamps (c-clamps) and spring clamps. This process is facilitated by the fact that one of the basswood planks is missing. The missing plank allows me to use a couple of spring clamps to hold it in the middle. Once the new rib has dried overnight, I decided to cut the battens first as it has to be easier than removing them and installing new ones. With over ten copper nails dubbed and clinched in each batten, it would be impossible to remove them in one piece, and they do have to fit exactly. 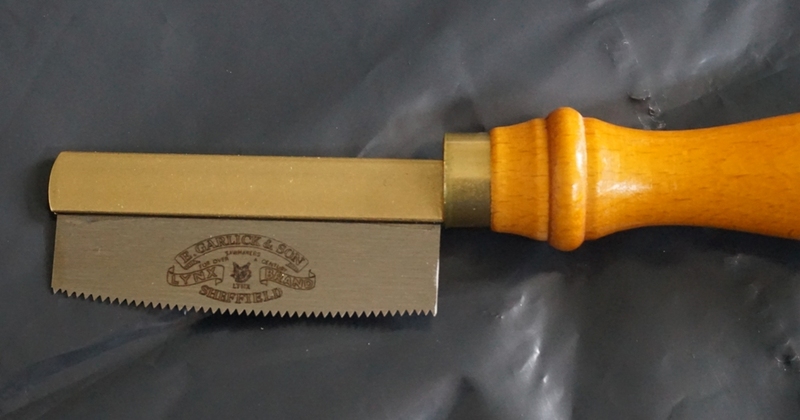 I cut the battens with an inlay saw (3″ or 76 mm blade with 20 teeth per inch and a 0.011″ or 0.3 mm kerf). 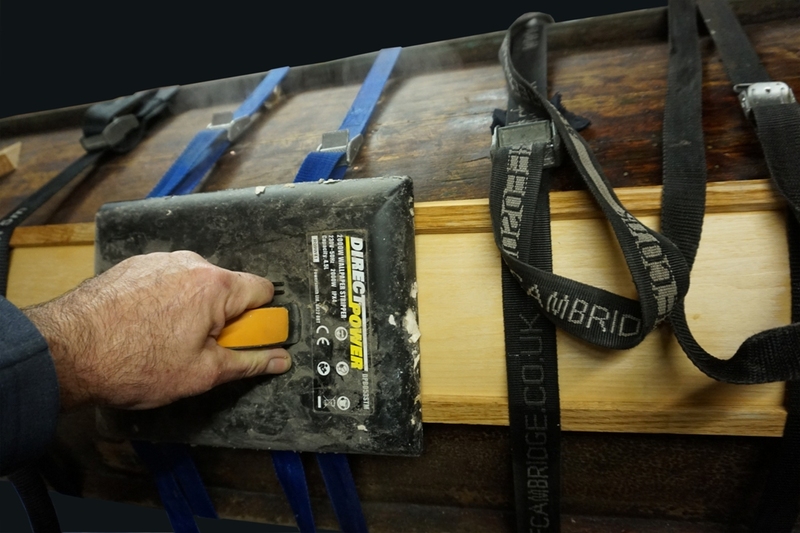 Its curved blade allows me to remove a small piece of the batten with less chance of damaging the planks. 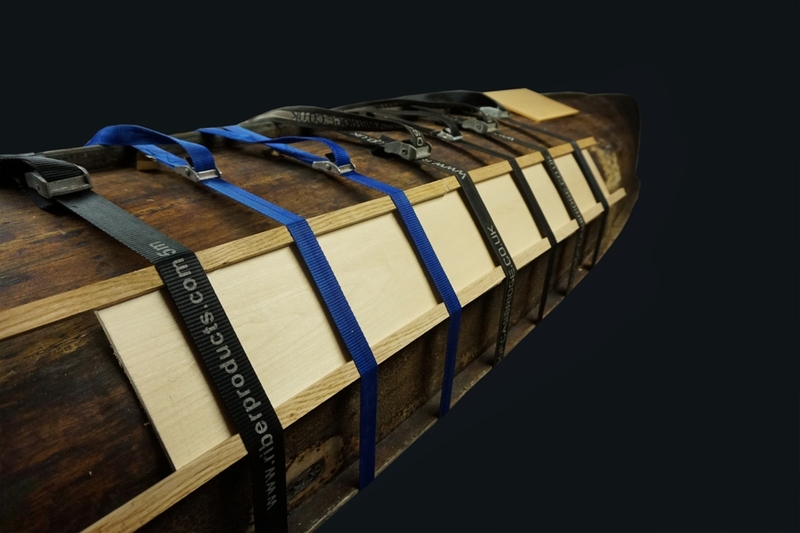 The battens are carefully marked and cut. I have to make sure the plank is clean where the new rib will go. 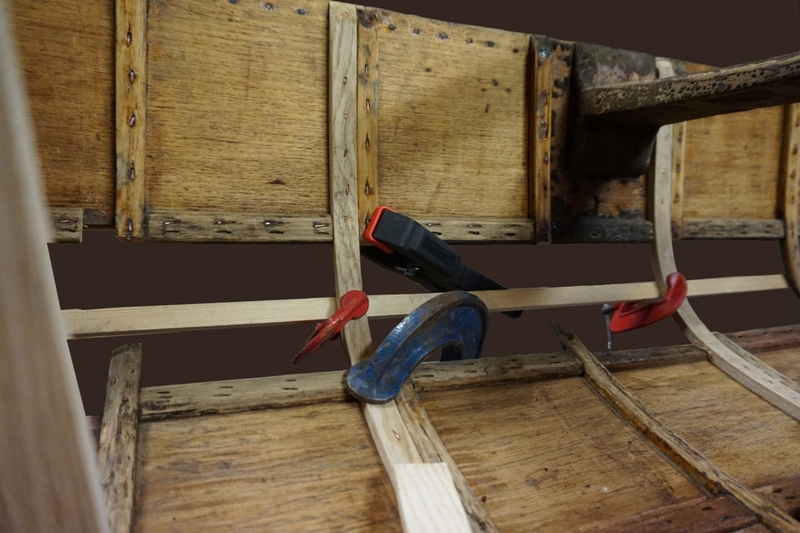 I clamp the rib in position making sure it fits well against the keelson and the original rib. 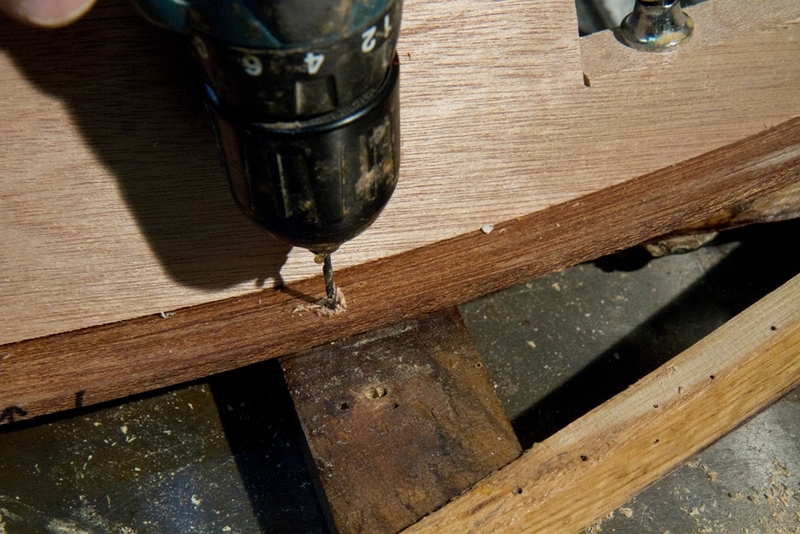 When the new rib is in place, I drill a pilot hole through the rib and plank at the centre of each rib. Then, I push a 19 mm (¾”) copper canoe nail in from the outside. The nail is then dubbed towards the keelson and clinched tight. Then, I pilot, dub and clinch three more nails into each plank as well as one at each batten. 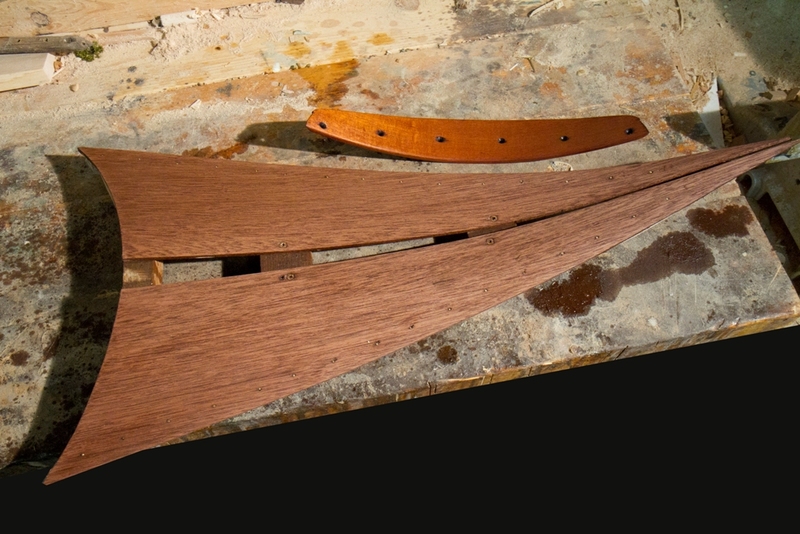 I cut the rib flush with the sheer-line and shape the rib-top to match the existing ribs. At the gap, where the broken rib is exposed, I cut it off in line with the battens. 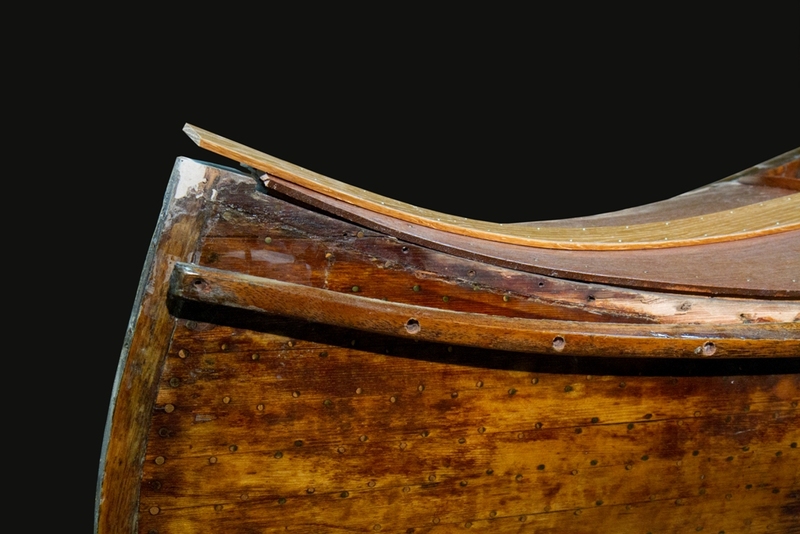 In some sections, retention of the original hull shape was facilitated by clamping a hardwood batten on the outside of the exposed original ribs. 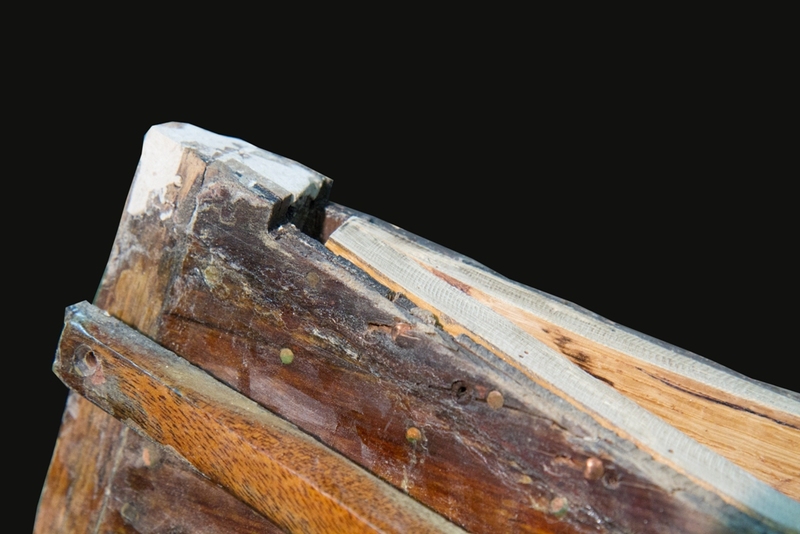 The broken sections of original rib were cut away with the inlay saw as well as the sections of batten required to allow for positioning of the new rib which was then soaked, steamed and clamped in place. 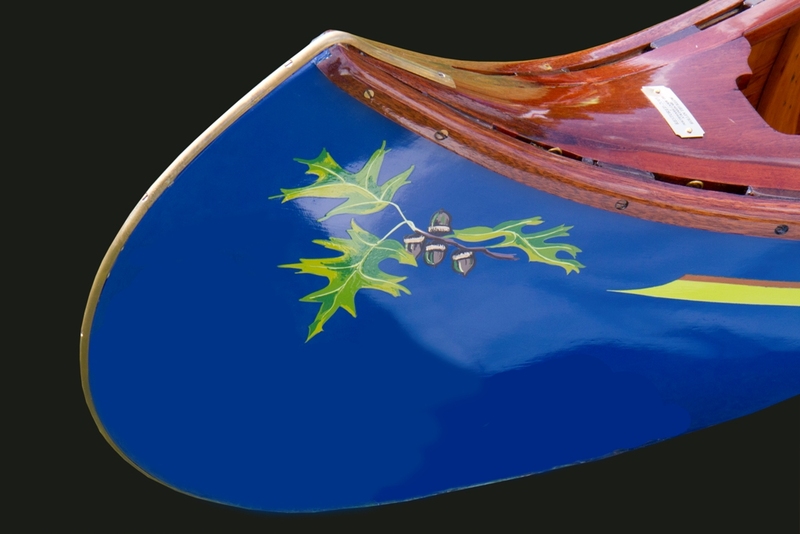 A total of twelve broken ribs were sistered in this canoe. 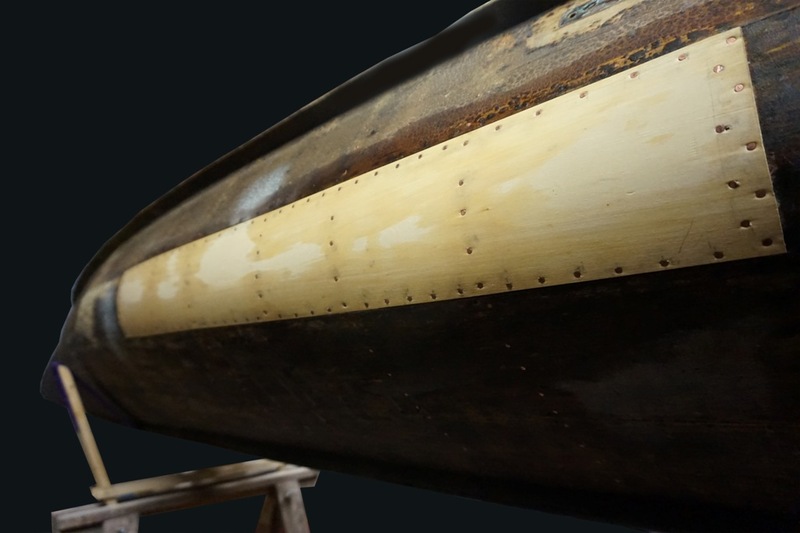 The ribs were repaired in stages, doing every second rib along the length of the canoe in order to maintain the shape of the hull as much as possible. 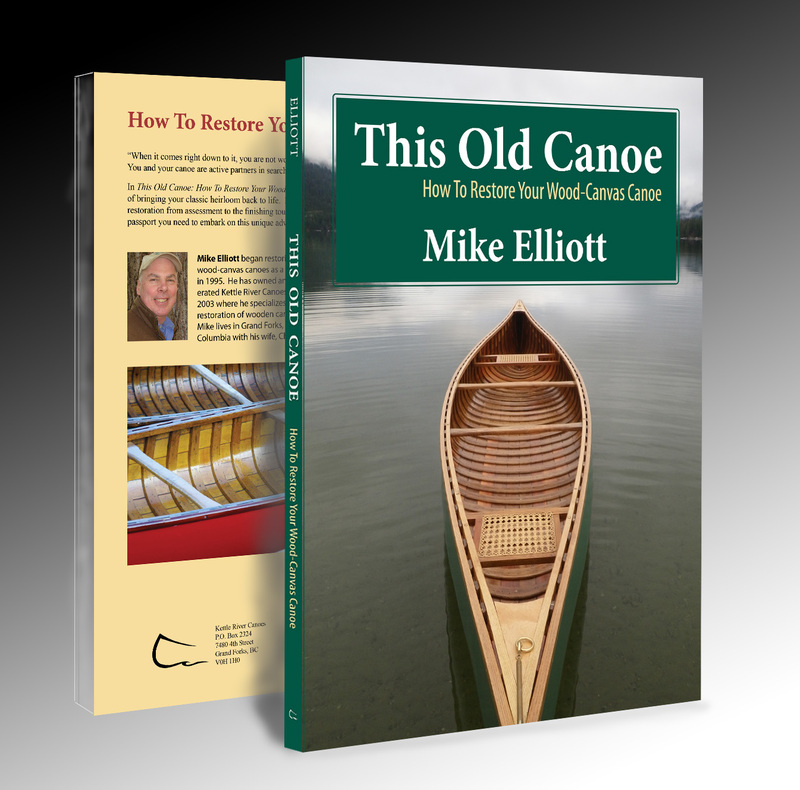 The entire restoration process (including rib repairs and replacement) is described in my book – This Old Canoe: How To Restore Your Wood Canvas Canoe.